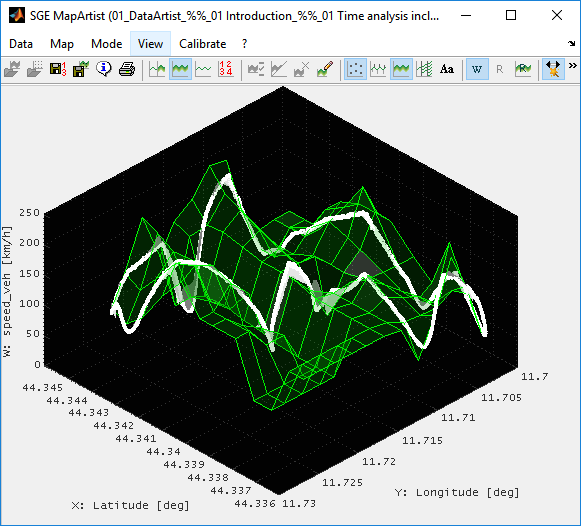 The SGE DataArtist is a tool to visualize and analyze measurement data. This manual contains information concerning specifically the SGE DataArtist only. The SGE DataArtist is part of the SGE Circus. For help topics regarding general features please refer to the corresponding documentation accessible using the links below. Add FileSet... Multiple files will be appended to one FileSet. Add FileSet quick... Just the files will be asked – the options will be maintained. Add multiple FileSets... Multiple files will be opened as multiple FileSet comparison overlay. Replace FileSet quick... Just the files will be asked – the options will be maintained. Ctrl + Pageup/down pans one axis unit and can be used to pan exactly one cycle if the axis is combustion cycles for indicating measurements. Resize main view to create space for the cursor if these should not overlay the main view. Toggle cursor options “Show hidden channels” and “Show only selected channel”. Add channel(s) to all FileSets. The selected channel dictates the FileSet whose channel list will be presented for channel selection. Add channel to the common Y axes of the currently selected channel. Show channel if hidden. Select channel by uninterrupted typing of its name. Use * as wildcard character. Select channel... Hide/show all other channels. Toggle markers for selected channel or all if none is selected. Toggle markers +lines for selected channel or all if none is selected. The main features of the SGE DataArtist are listed in this introduction. For details please see the following sections. The whole session including data can be stored as file. After re-opening the whole functionality can be used again immediately. File size is depending on loaded data. When the template is loaded, the session is reconstructed. Add annotations to highlight and notice events in the data loaded. The data loading procedure is explained in the documentation of the SGE_Circus because as it is common to all tools. We recommend that you read that section first as useful features like sample reduction, logical load conditions, calculated channels are explained there. → SGE Circus documentation "Loading data"
When starting the DataArtist you will be immediately asked for files and channels to load. Data is organized in so called FileSets. A FileSet consists of one or more files. In the case of multiple files, the files are automatically sequenced. To be able to recognize the file borders, the channel “FileCnt” can be loaded, which displays them graphically and textually, if the text translation option is active in the cursor (Cursors). The DataArtist can handle multiple FileSets. So when you already have loaded data and you choose to add another FileSet the data loading procedure is repeated and a second FileSet is created. 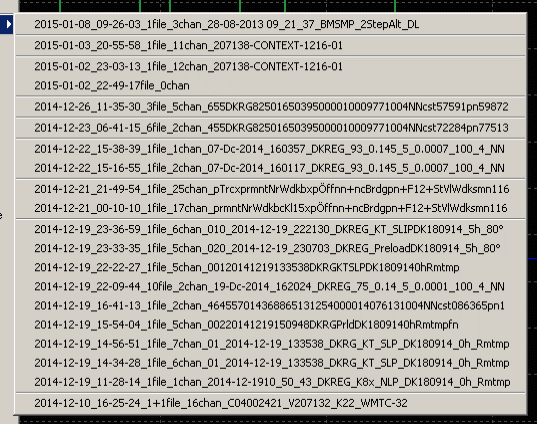 The channels names are extended with “_F2” for second FileSet. If the second FileSet contains channels that are also loaded in the first FileSet they are put together on common Y axes and colored similarly. Using drag and drop or pasting files enables to quickly load any number of files. See the following chapter for details. FileSets can be shifted and synchronized. You can simply pick any channel of a FileSet with the right mouse button and drag it horizontally. After releasing the mouse button you can decide whether to shift all channels of this FileSet accordingly. Alternatively you can do a automatic synchronization (see below). Several modes to add and replace data are supported. Add data from one or multiple files. One new FileSet will be created from the data by appending the files sequentially. This way any number of files can be loaded and processed at once. Because of the appending this mode is not suitable for comparison of the single files. Add multiple FileSets successively or use "Add multiple FileSets" if you want to overlay or compare data from multiple files. Drag&Drop and Copy/Paste is also available and also session and template files can be opened. Quickly add a new FileSet. Only the files will be asked. The options will be adopted from the actual FileSet which is the one of the selected channel or the first one if no channel is selected. Again multiple files can be selected at once and will be appended to one FileSet sequentially. In this mode the single files will not be appended to a single FileSet. Instead individual FileSets will be created. Depending on the mdoe chosen these will be done to create a FileSets comparison overlay or to add separate tabs for the single files. Choose how to handle the file(s) to add. For each file to load a new FileSets inside the current view/tab will be created to obtain and overlay of the single FileSets. Use this mode to compare and overlay multiple files. For each file to load a new individual Tab will be created. When data is already loaded without a tab existing a new tab will be created first automatically for this data. When selected the options will be asked only once and no options will be asked from the second FileSet. They will be adopted from the existing FileSet. When selected the filenames will be sorted before processing. Replace the data of the actual FileSet. Channels and options will be asked again. The actual FileSet is the one of the selected channel. Quickly replace the actual FileSet. Only the files will be asked. The options will be maintained. The actual FileSet is the one of the selected channel. After data loading process you are asked for some options. To accelerate the display a sample reduction method can be chosen. "Unreduced" means no reduction. Every sample of the loaded data will be displayed. This may slow down the software immensely. "Automatic" lets the program choose a suitable reduction automatically, which is then dynamically adjusted to the actual view avoiding aliasing effects. 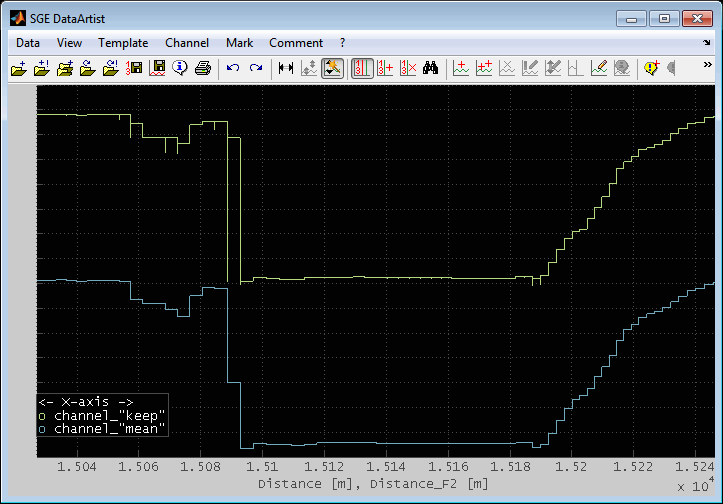 So even in automatic mode you will be able to see spikes and the data value range. To switch between "Automatic" and "Unreduced" use the corresponding menu item. You only need to choose the "Unreduced" option if you need to look at values between the minimum and maximum value for one axis point. This is especially important if you turn on the line markers and turn off the lines itself (e.g. when using xy view). With display option "Automatic" you will only see a reduces set of data values. The following two figures show the difference in visualization using "Unreduced" (1. figure) and "Automatic" (2. figure) when creating a xy view with markers only. Select whether to display annotations derived from the files to load like e.g. user pause comments or trigger events. Depending on the data loading mode you will be asked for detailed options afterwards or the options will be adopted from an existing FileSet. See “Add annotations from file” for details. Choose the channel to use as x-axis to get a x/y diagram. "Default" is the standard axis from data load procedure which is mostly the time. To create a x/y view select one of the loaded channels to be the x-axis. If the chosen channel (for x-axis) is not monotonously increasing, the values will be sorted automatically. Therefore, it is often useful to turn on the line markers, turn off the lines itself and to switch the display option to "Unreduced". See the previous section to understand the effect of this setting. In case the x-axis contains duplicate values you can select how to handle them. keep: Maintain all duplicate values. The display will show all or only only the maximum and minimum value depending on the “Display sample reduction” setting and there channels a line display will have vertical steps. mean, max, min, mean: Calculate a statistical value of duplicate axes values. The sample count will reduce accordingly. See the following figure for a comparison of the “keep” and the “mean” setting for the same data channel. Define a offset and factor for the axis values of the loaded data. This can be used to synchronize the FileSets. You can enter an numeric value or "auto" to start a wizard for an automated matching of two channels to find the optimum offset. "keep" means to adopt the values of the available data. This is only valid if you replace a FileSet or load from template. The offset can also be adjusted later on in the graphical view by dragging the channels. The factor must be > 0. You can also replace a FileSet (Ctrl + o). Just mark one channel of the FileSet and choose “Replace FileSet”. The channels and load data options are asked and prefilled with the information from the FileSet to replace. When replacing a FileSet while multiple Tabs exist sharing the same files you will be asked whether to replace the files for all Tabs. To speed up data loading use the Add/Replace FileSet quick feature (Alt + o, Alt + Shift + o). Only the file(s) to load will be asked then. The options will be maintained. Therefore it is easy to replace or add files while keeping all display settings, calculated channels etc. In case a channel is selected its FileSet will dictate the options to use. In case no channel is selected (Esc) the first FileSet will be used when adding a new FileSet. 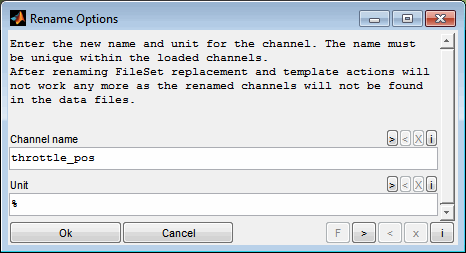 To replace a FileSet a channel must be selected when multiple FileSets exist. To delete all channels of the FileSet and therefore the entire FileSet use the corresponding menu item or keyboard shortcut (Ctrl + Del). Select the FileSet(s) to delete all channels for from the current view. Deleted channels will also be removed from overview and GPS view. Remember that the options below must also apply for the channels to delete. If this option is activated, only channels that contain completely invalid values (NaN, inf) or are empty are deleted. Only channels of the FileSets selected above are taken into account. If this option is activated, only hidden channels are deleted. If this option is activated, you then have the option of manually selecting the channels to be deleted again in a dialog that is preset according to the criteria specified here. In addition to using the file load dialog, you can load sessions, templates and data files by using drag and drop or the clipboard. To do this, one or more files can be dragged directly to a DataArtist session or inserted via keyboard shortcut (Ctrl + v). It is also possible to copy files directly to the clipboard as well as strings containing the file names line by line. Adding data files this way will create one or more new FileSets. Choose how to handle the file(s) to add. You can create a new FileSet or replace an existing one. The files will be added as a single new FileSet by concatenating the files sequentially. The files will be added as a multiple new FileSets. One file gives one FileSet. The channels and options will be asked only once. If “Quick” is selected they will be adopted from an existing FileSet. The files will be added as a single new FileSet and they replace the FileSet of the selected channel. The files will be added as a single new FileSet and they replace all existing FileSets. When selecting “Quick” no options will be asked from the second FileSet. They will be adopted from the existing FileSet. They will be adopted from an existing FileSet. When selecting “Sort filenames” the filenames will be sorted before processing. If you already have loaded a FileSet and use the Replace functionality it is automatically checked for an update. This means that if in the directory of the currently loaded file exactly one file with the same ending exists that has a newer file date this one is proposed to be loaded directly without asking options. The files the data was loaded from is remembered and will be used e.g. to prefill the dialogs when reloading data. They can also be displayed using the data info (Ctrl + Shift + i). Data may also be deleted (Ctrl + d). This is mainly useful to reduce the size of session files to save or to avoid Out Of Memory errors when handling big amounts of data. Beneath deleting single channels (Del) or FileSets (Ctrl + Del) it is also possible to delete data e.g. inside/outside the actual view or inside/outside the marks. Choose the sections to delete the data from. Channels without remaining data will be deleted afterwards. Deleting data cannot be undone. 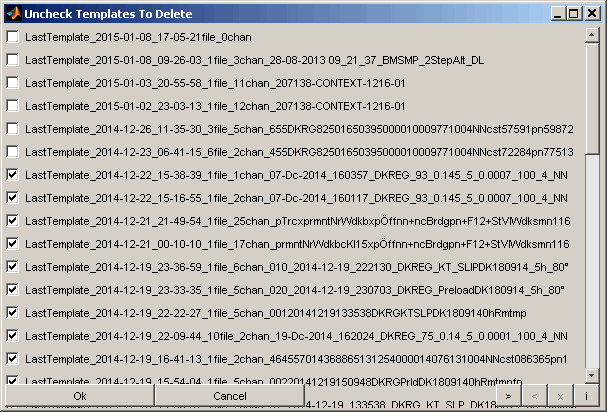 Deleting data is not remembered in a template file. So loading a template from a session with data deleted will again load the complete data. You can display some information about the loaded data (Ctrl + Shift + i) like file names, comments, axes details, data loading history and calculated channels. This may be helpful to document the work done. In case of multiple loaded files you can also see the axis order of the files from this information. For some file formats (MDF, Keihin, 2D) editing of the file comments is supported (Ctrl + m). In case of multiple loaded files you will be asked which file to edit. You can also choose all and the comment of all loaded files will be overwritten with the input. You can add channels to a single FileSet (Ins) or to all FileSets at once (Ctrl + Shift + Ins). The added channels will be loaded with the same settings (e.g. logical load condition) as the data already displayed. In case channels should be added to all FileSets the selected channels dictates the FileSet whose channels are presented for channel selection. The FileSet to add the channels is displayed in the heading of the channel selection dialog. It is also possible to delete single channels (Del) or all (Ctrl + Del) channels of the FileSet that correlates to the selected channel from the display. Deleted channels will also be removed from overview and GPS view. Exactly one channel can be selected at a time. The selected channel is underscored in the cursor and highlighted through a increased line width of its data curve. To select a channel you can click to its data curve or its name in the cursor. You can also perform a long click to highlight and display the channel exclusively. It is also possible to select a channel by uninterrupted typing of its name in lowercase letters. After stopping to type a matching channel will be searched and the first match will be selected. Use * as a wildcard character. Alternatively a channel may be selected using the corresponding menu item (F3). Choose the channel to select and highlight. The channel will shortly be shown exclusively by hiding all other channels and will be underscored in the cursor list. The selected channel will be made visible if it is hidden currently. If enabled all channels except for the selected one will be hidden. If disabled the channels that were hidden the last run will be reshown. 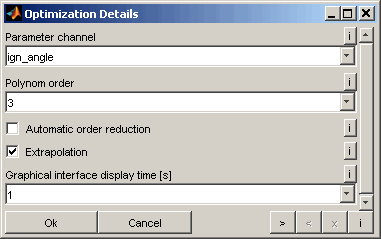 Various display options can be modified using the channel configuration dialog (F4). The input can be saved in and loaded from a file to allow quick access to commonly used settings. Also quick access to the latest setting is available in the Data menu. For automatic spacing enter the limits as numerical values separated by spaces. For limits and spacing enter a valid vector syntax with colons. Maximum and minimum must not be equal. If you modify the range of a channel joining a common Y axis you will be asked whether to modify also all other channels of the common Y axis or to remove the channel from the common Y axis. Specify the minimum and maximum limits separated by colon or space. For full range enter "a" or "auto". Maximum and minimum must not be equal. 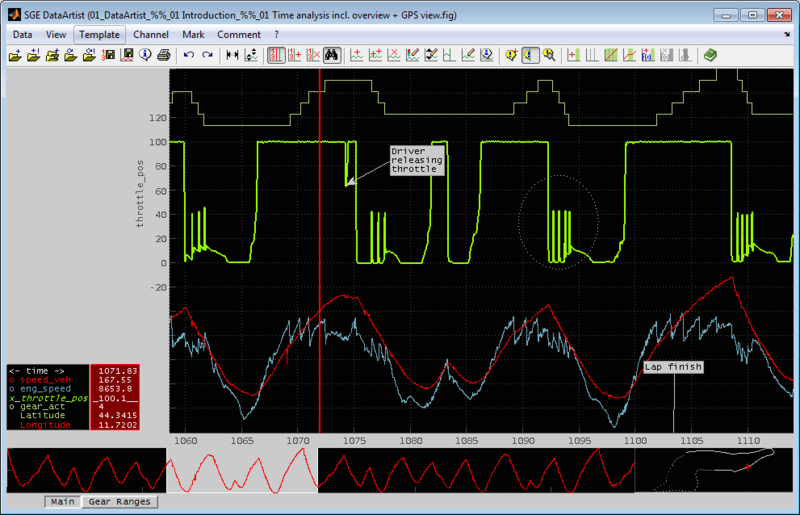 The plot type can be adjusted to display channels as stairs, line or stems. Also a default setting is available. This can be modified using the menu item “Default plot type”. The “scatter” setting is used to display data points colored accordingly to the values of a color source channel. In this case you do not select a color for this channel but the color source channel instead. Depending ob the scale (y-axis range) of the color source channel the colors a chosen for the scatter channel automatically. A scatter must have a marker type o, square, diamond, ^, v, <, >, pentagram or hexagram. 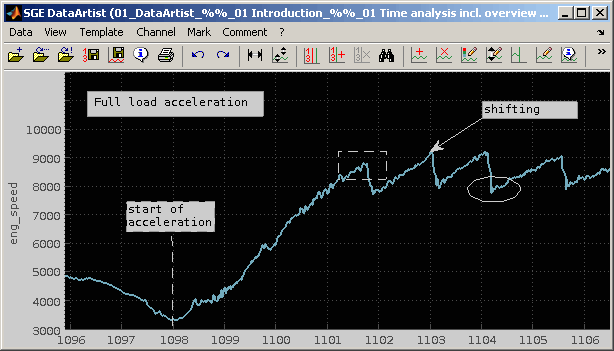 As an example in the following figure the speed_veh channel is colored by the gear_act channel. The format does affect the display of the data values inside the cursor tables. Choose between physical, hexadecimal, binary and octal format. Be aware that for all formats except for physical the data values are rounded towards the nearest integer and limited downwards to zero. You can modify the color of each channel by a color selection dialog (Shift + enter) or quickly by switching to next / previous color (Shift + n, Ctrl + n). In case the channel is a scatter channel you will be asked for the color source channel instead of the color itself. The colors are remembered as a preference for the channels names. So if channels are loaded at a later date the colors will be reused if the channels names are already registered. 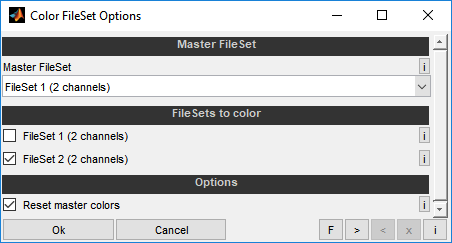 The option “Color all FileSets” will automatically color channels of multiple FileSets accordingly to the color of the corresponding channels of a master FileSet. To find corresponding channels the names must only differ after an underscore (gear → gear_F2, gear_Var1 → gear_Var2). The colors will get lighter with higher FileSet numbers. This way you can easily come to a clearly visible file comparison by coloring the first FileSet with strong colors and the choosing this option. Select the FileSet to use as master for the colors to apply. Its colors will remain unchanged unless you use the "Reset master colors" option. Select which FileSets to apply the colors to that will be derived from the master FileSet selected above. Select whether to reset the decolorized colors of the master FileSet before applying colors to the other FileSets. A set of features is available to adjust the channels Y-ranges. The ranges are remembered as a preference for the channels names. So if channels are loaded at a later date the ranges will be reused if the channels names are already registered. If these ranges would lead to place the data loaded completely outside the screen range they will get discarded. The range and tick dimension of the y-axis can be set for each channel separately. Additionally multiple channels can be assigned to a common y-axis using the channel range dialog (Enter, Mouse double click to channel or cursor entry). You can provide the limits only or the limits and the spacing. For the limits only enter them as numerical values separated by spaces. 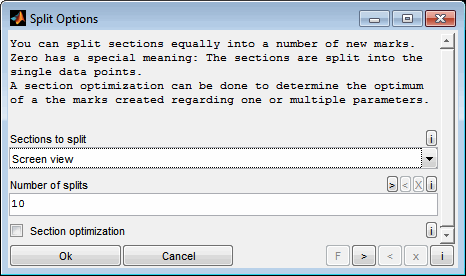 For limits and spacing enter a valid MATLAB vector syntax with colons. If the limits difference does not match a multiple of the spacing the max. limit is modified accordingly. The maximum limit can be lower than the minimum to create a reverse axis. Maximum and minimum limit must not be equal. These Y-range and scaling can also be accessed by keyboard shortcuts or mouse gestures (Ctrl + +/-, Ctrl + Up / Down). You can alternatively choose from a list of predefined ranges. For example 2/5 means that the y-axis is split in 5 parts and the channel is placed in the 2nd one from the bottom. If "Smart range" in the menu is turned on the limits will be adjusted to some round values. These actions can also be accessed by keyboard shortcuts (Ctrl + 0..9, Ctrl + Shift + 0,ß). The selection in the predefined ranges field will only be considered if values for limits and spacing are not modified. With the check boxes you can choose the channels that should use one common y-axis. Initially all channels sharing the axis of the selected channel are checked. When you check additional boxes these channels will be scaled to the axes of the already checked channels. If you uncheck boxes these channels are set to a separate (new) axis. If you uncheck multiple channels all of them will be set to one new common Y axis. A common action for all channels can be performed to group all channels to one single common Y axis or to remove all common Y axes correlation and use separate axes for the single channels. When this option is used the checkboxes above will be ignored. Additionally a channel can be added quickly to the common Y axis of the currently selected channel (Ctrl + Mouse click). The positioning and range setting can be done very easily using the mouse. By dragging a selected channel with the right mouse button you can move it in y-direction. By zooming a selected channel with the left mouse button you can adjust its y-range. The following figure illustrates the zooming behavior. In order to avoid misunderstandings, the zoom is only performed when parts of the data of the channel are later within the screen. If the entire channel were outside, it will not be scaled. 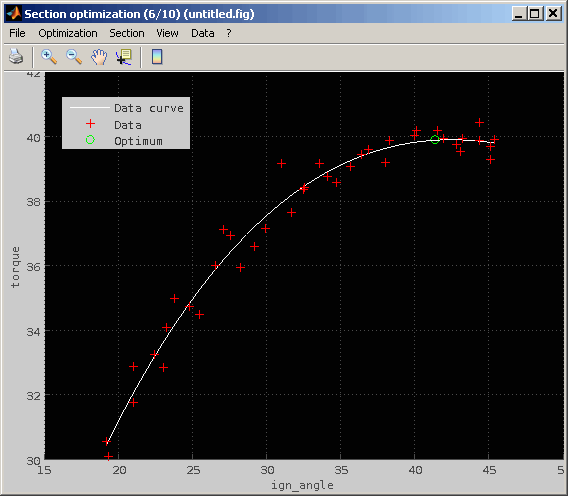 When scaling using the mouse, all channels of a common Y axis are scaled. By dragging with the right mouse button while Ctrl button is pressed you can scale the selected channel it in y-direction. If you click exactly to the channel before dragging this channel value will remain its position on the screen while the parts above and below will be scaled. Otherwise the mean value of the channel will remain its position. All operations refers to the selected channel. All channels of a common Y axis will be handled commonly. In the channel menu you can check a “Smart range” option. In this case the y-axis range is rounded to even values when using the predefined ranges or mouse actions. Several keyboard shortcuts are supported to quickly adjust the channels Y-ranges (Ctrl + 0..9, Ctrl + Shift + 0,ß, Ctrl + +/-, Ctrl + Up / Down). See “Keyboard shortcuts, mouse gestures“ for a full list of supported shortcuts. Channel can be hided in the graphical view (Ctrl + h). 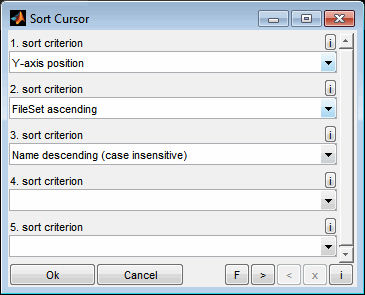 Depending on the configuration of the cursor they are anyway listed in the cursor table to allow data evaluation. It is also possible to hide/show all channels sharing a FileSet at once (Ctrl + Shift + h) or all channels sharing a common Y axis (Shift + h). Additionally a hidden channel can be shown quickly by using Ctrl + Mouse click. Remember that this also adds the channel to the common Y axis of the currently selected channel. You can shift one or all channels of a FileSet (Ctrl + shift + x, Mouse right button drag). This means that its axis values are modified with an offset. The mode can be absolute or relative. When relative is chosen the input value is added to the actual offset. When absolute is chosen, the actual value is ignored and the total offset is set to the input value. Shifting channels may also be done using the Channel Configuration dialog (F4). This feature is e.g. 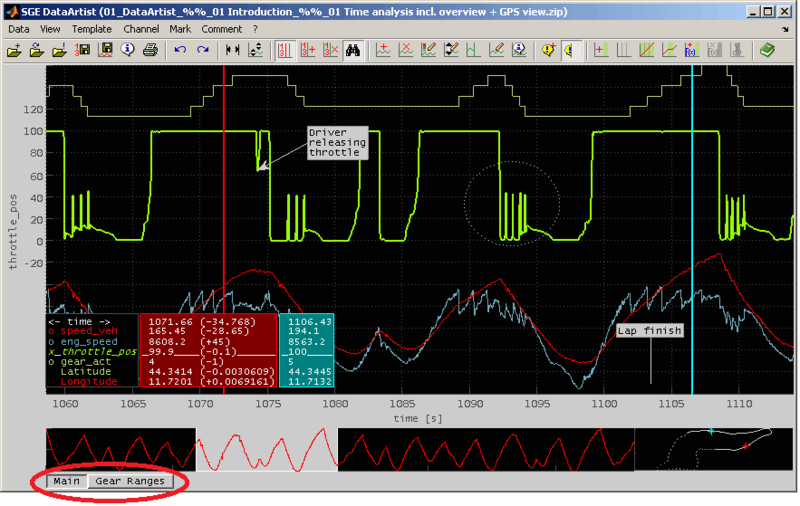 helpful is you want to correct emission analyzer time offsets to synchronize emission channels to ECU measurement channels. This feature (Shift + F4) will automatically style channels depending on search patterns related to the channel names. You can use rules to select channels relating to their names and apply colors, markers, line style, ranges and common Y axes settings. You can use rules to automatically set line styles for channels in relation to their names. One rule is given per line. The string to look for and the line style are separated by two colons, like "EngineSpeed :: ;". The assignment is done in the order of lines from top to bottom. Use * as a wildcard. You can use rules to automatically set markers for channels in relation to their names. One rule is given per line. The string to look for and the marker symbol are separated by two colons, like "EngineSpeed :: o". The assignment is done in the order of lines from top to bottom. Use * as a wildcard. You can use rules to automatically show/hide channels in relation to their names. One rule is given per line. The string to look for and the visibility status are separated by two colons, like "EngineSpeed :: hide". The search is done in the order of lines from top to bottom. Use * as a wildcard. You can use rules to automatically set the Y-range for channels in relation to their names. One rule is given per line. The string to look for and the range definition are separated by two colons. You can provide the limits only or the limits and the spacing. Additionally you can provide a relative range part to fill by the matching channels. For limits only enter them as numerical values separated by spaces. For limits and spacing enter a valid vector syntax with colons. If the limits difference does not match a multiple of the spacing the max. limit is modified accordingly. The maximum limit can be lower than the minimum to create a reverse axis. Maximum and minimum must not be equal. For a relative range part enter the part and range separated by a /. When assigning the ranges you can decide whether to adjust the limits entered to some round values (smart range) or to exactly set the entered values. Channels sharing the same ranges can join a common Y axis. By modifying the ranges common Y axes may be concerned. Different modes are available to handle the common Y axes when applying ranges automatically. When a channel range is modified by automatic assignment and the channel joins a common Y axis with other channels, all other channels ranges will also be adjusted to maintain the common Y axis. When a channel range is modified by automatic assignment all existing common Y axes will be checked for a matching range. If a match is found the channel will be added to the common Y axis. For the channels modified common Y axes will be created if some of them have the same range after automatic assignment. The existing common Y axes will not be modified. For the channels modified no common Y axes will be created. All of these channels will have an independent axis even for channels with the same range. The existing common Y axes will not be modified. For the channels modified no common Y axes will be created. All of these channels will have an independent axis even for channels with the same range. Additionally all existing common Y axes will be removed and the correlating channels will get independent axes. You can use rules to select channels relating to their names and apply a common color. One rule/color per line. The number of lines must agree with the number of color selection buttons below. Color buttons can be added, removed and reordered using the small buttons on the right. The assignment is done in the order of lines from top to bottom. Use * as a wildcard. For all assignments you can decide whether the string interpretation should be case sensitive and treated as a regular expression. If a channel is selected you can get information regarding its values and axis by the channel info (Ctrl + i). 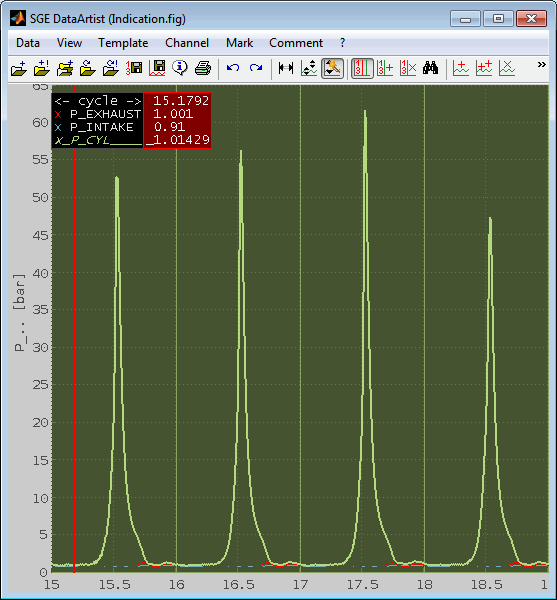 Some statistical values of the currently visible part of the channel, min, max, mean, std values and curve fits are displayed. This allows quick determination of e.g. 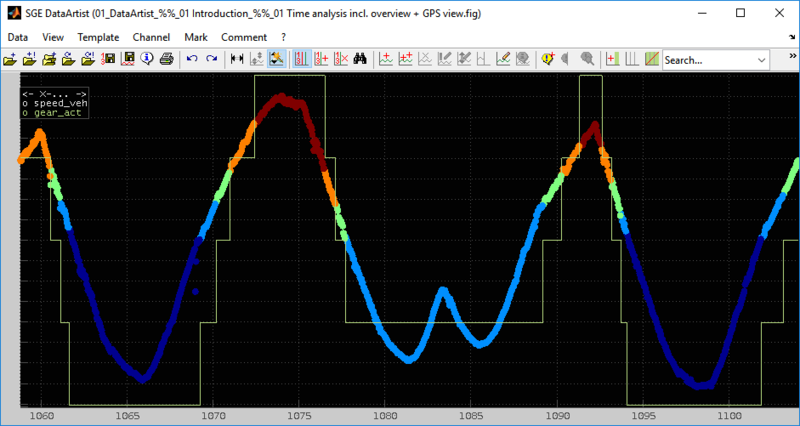 gradients, mean values and standard deviations. The information is calculated from the channel data within the current x-axis range. Adjust the visible area accordingly before requesting this info to ensure to get the information desired. The display of this dialog may last long in case of channels with big data amounts. Channels are handled with the names loaded from the data files. For FileSets > 1 automatically extensions (_F2) are added. You can rename the channels. Either individually when a channel is selected (F2) or using replacement patterns (Ctrl + F2). The names must be unique within the loaded channels. If you need the name to agree with the ASAP MCD rules it must consist of a-zA-Z0-9_. only with a max. length of 32 characters. 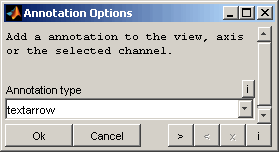 When renaming the selected channel a dialog allows to modify the channel name and its unit. When renaming the channels using replacement patterns they must be given one rule per line. The string to look for and the replacement are separated by two colons, like "EngineSpeed :: RPM". A special meaning have "<<" and ">>". In this case the replacement pattern is appended to the beginning (<<) or end (>>) of all channels of the selected FileSets. This is used to append without replacing. E.g. for FileSet1 channels - when no _F2 is available to replace. The replacement is case sensitive and done in the order of lines from top to bottom. If enabled the replacement for a channel will be aborted after the first rule leading to a change. Otherwise all replacement rules will be applied sequentially. If the corresponding check box is set the strings are interpreted as regular expression. After the editing was done a message will inform about the channel name modification and allows to undo the changes. 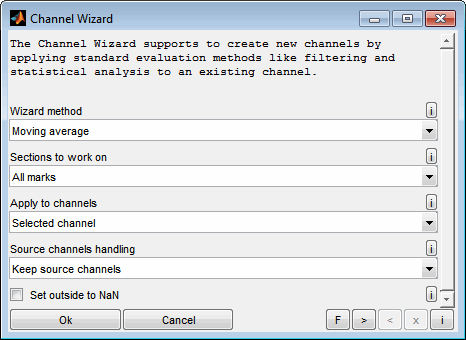 The channel wizard allows to create new channels by performing common tasks (like filtering, statistical evaluation, curve fitting) to the loaded channels. 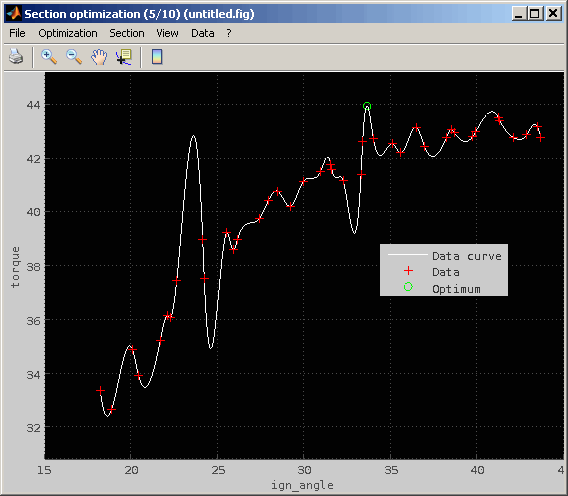 A moving average can be applied using a graphical preview GUI. Choose the filter length in the upper diagram to see the result in the lower diagram. You can use the zoom buttons to adjust the view of the lower diagram and keyboard shortcuts to adjust the filter length. 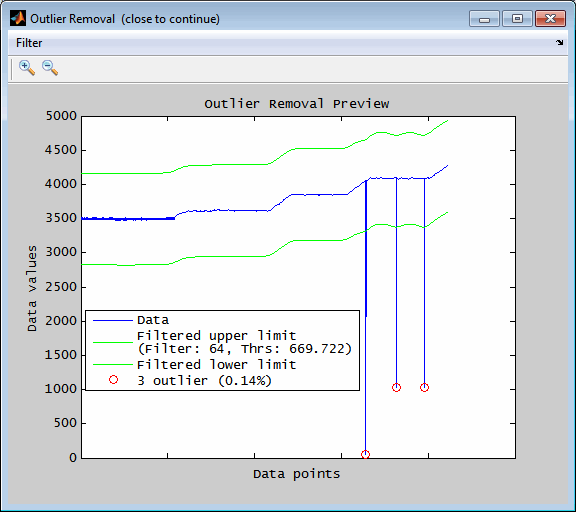 Outliers are searched for that lie outside a definable band around a filtered course of the data. In addition, outliers are detected by absolute thresholds. 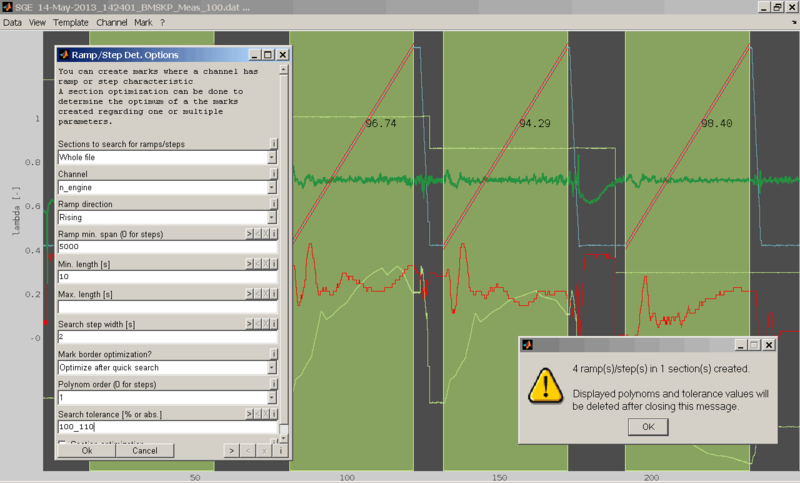 The data, the band around the filtered course and the detected outliers are displayed and can be conveniently adjusted by keyboard shortcuts until the result is satisfactory. Then the window must be closed and the outliers are replaced by invalid values (NaN) or interpolated between valid neighbors if any. The resulting channel data values will be the mean / max / min value of the source channel. A cumulative sum of the channel starting at zero is calculated. When relative is chosen the sum is scaled to the max. value and therefore ends at one. This method is used to handle multiple values at a single x-axis point. So if the channel contains multiple values at one axis point, you can calculate the mean / max / min value of all data values with the same axis value. This especially useful in x/y view mode to calculate e.g. mean indicating cycles. Curve fits of the channels to work on can be done. The coefficients and determination criteria values are printed to the console. 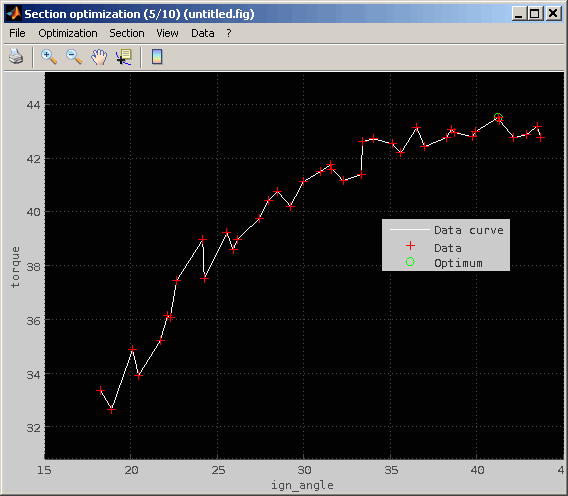 A linear curve is fitted to the data and then subtracted from the data. This can be used to compensate drifting data. You can decide to which part(s) of the data you want to apply the method. This can be the whole file or sections of it defined by marks or the screen view. You can decide to apply the filter/method to the selected channels, all channels or the channels of the current FileSet/common Y axis. Alternatively you can select the channels to apply to manually. You can decide to delete, hide or replace the source channels after creating the new channels. 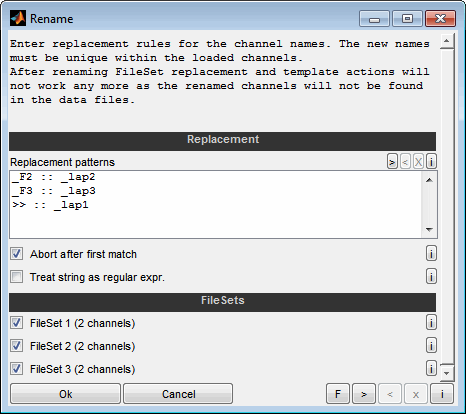 Delete and replace are similar with the difference that for "delete" the new channel will have a new name indicating the modification while for "replace" the name of the new channel will be the same as the source channel. You can set the parts of the data that does not apply to the sections to NaN what makes them invisible. Channels created by the wizard will not give reliable results when loading a template – especially when using logical load conditions. It is recommended to add the channels directly as calculated channels when loading the data if templates should be saved. 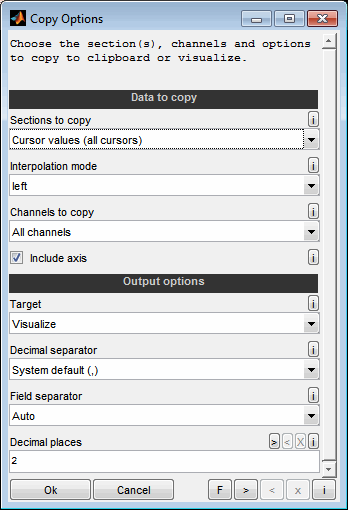 The “Analyze” menu supplies some commonly used tasks to analyze the data of the selected channel. Choose the channels to use for the axes of the histogram. When selecting only one channel a 2D histogram will be created. From two selected channels a 3D histogram will be created. When the second channels axis does not match the axis of "Axis 1 channel" it will be interpolated automatically. 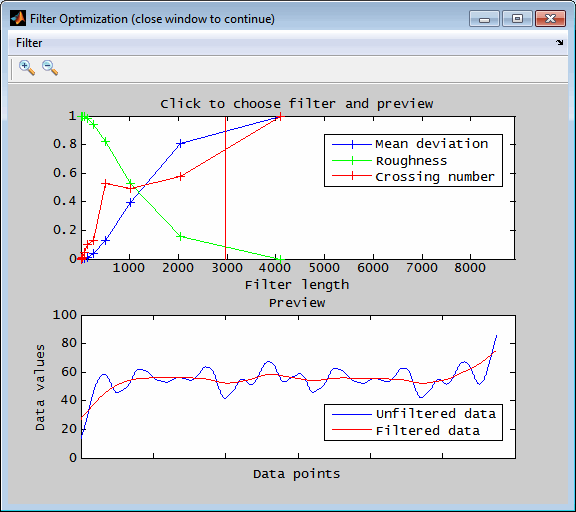 The interpolation method depends on the plot type of the channel. "line" type will use linear interpolation while all other plot types look for the next value to the left axis side. The plot type can be set in the "Channel configuration". Enter an expression to define the histogram bin position. This can be the number of bins as a single numeric value, a vector of bin position values or "auto" for automatic detection of a suitable bin number. In case a vector is given the bin borders are in the middle of the bin positions. Therefor the bin positions are not necessarily the center positions in case of unequal spacing. 10 10 bin with equally spaced distance. auto Automatic detection of a suitable bin number. [1 2 5 10 20] 5 bin with given positions. 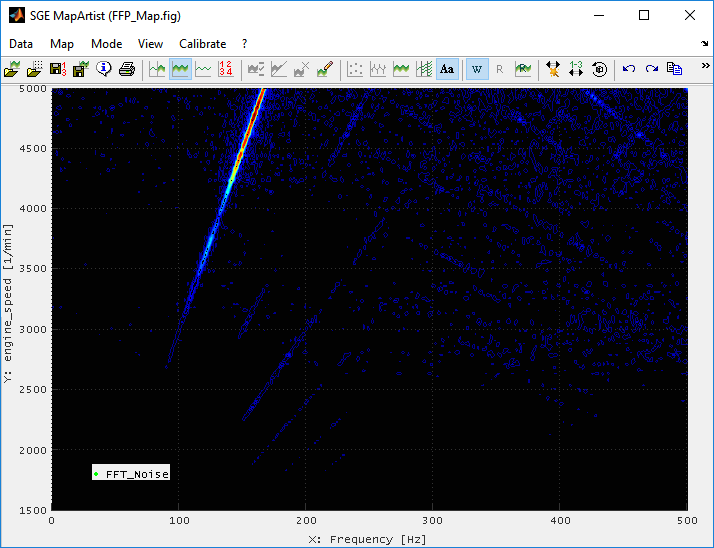 One or more FFT analysis of the actual selected channel data will be created. 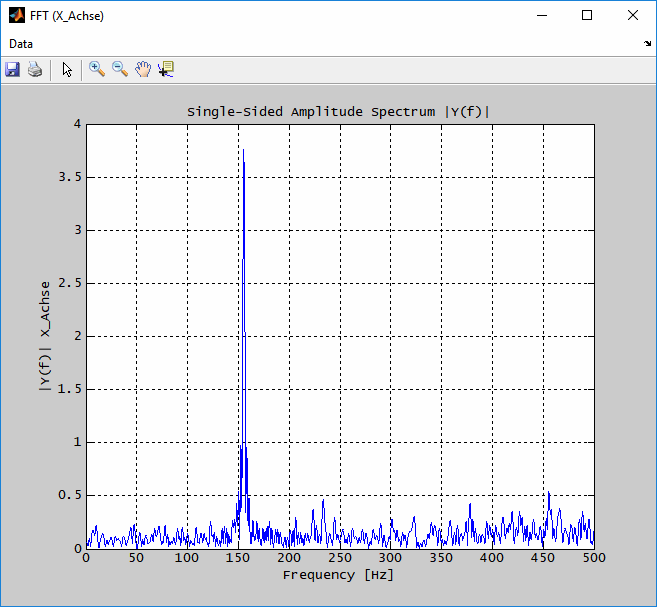 For the FFT to have a meaningful frequency axis the data of the channel to analyze must be sampled with constant frequency and the axis unit must be seconds. If this is not the case, the FFT will be calculated for an average sampling rate and you will be notified accordingly. If the source data deviates from this sampling rate or the axis unit is not seconds, you must interpret the frequency axis yourself. Enter the number of FFT axis samples to create. The value must be in the range 2..2^12 and will be rounded to the next power of 2 automatically. Leave empty to determine automatically. The resulting display will only include the positive frequency part - so the resulting axis samples are n/2+1. Select the sections to create individual FFTs for. In case multiple FFTs are to be created these will be displayed as a map with one axis resulting from the frequency and the other from the section channel. 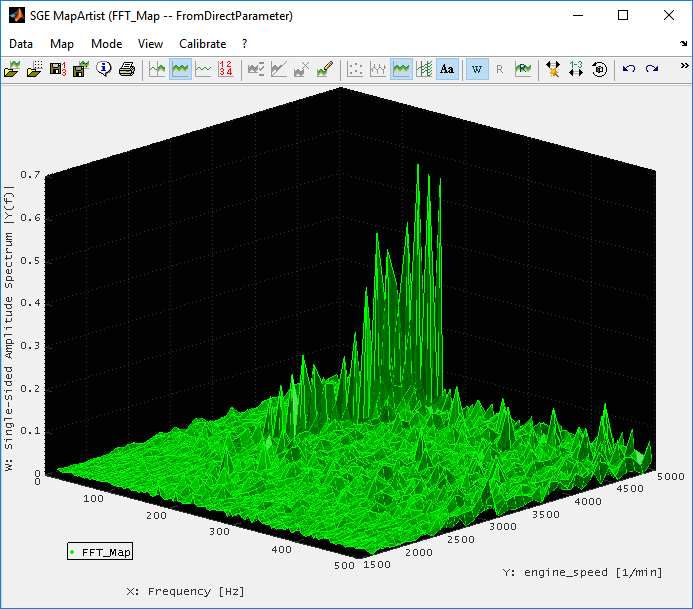 As an example you could split an engine speed ramp with noise recording into marks covering separate engine speed ranges and than create separate FFts of the noise for the single marks. When selecting multiple sections to create FFTs for you can assign a section channel. For each section the mean value of this channel will be used as axis value for the resulting FFT map. 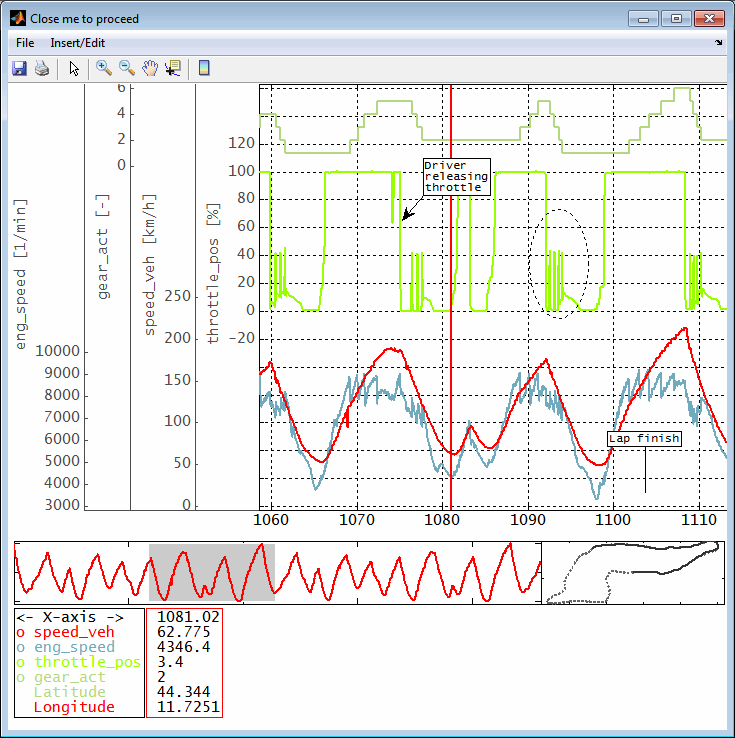 In our example of the engine speed ramp with noise recording select the engine speed as section channel to display its values with the map. Choose the channel to use for the X axis of the MapArtist. If this channels axis does not match the one of the axis W channel it will be interpolated automatically. 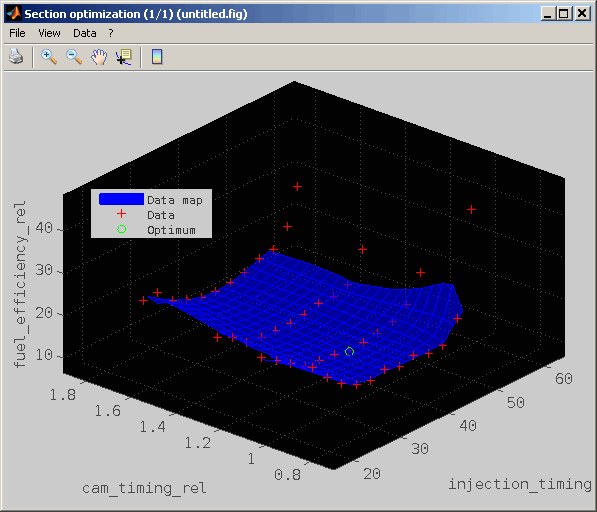 The interpolation method depends on the plot type of the channel. "line" type will use linear interpolation while all other plot types look for the next value to the left axis side. The plot type can be set in the "Channel configuration". 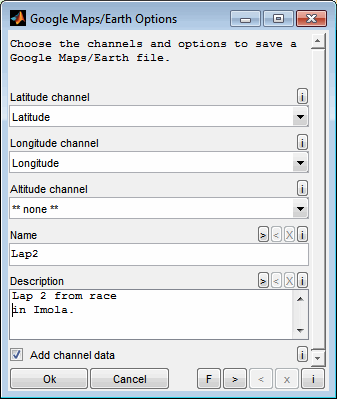 Choose the channel to use for the W data of the MapArtist. Select the sections to collect the data from. The loaded calculated channels can be displayed. You can only visualize the calculated channels here. To modify them you need to reload the FileSet and edit the calculation. Split channels to create individual channels for single sections of the data loaded. This makes it possible, for example, to conveniently superimpose individual sectors of the data loaded without loading multiple FileSets. Common use cases are the superposition of the single laps of a race track recording or the superposition of single combustions of a cylinder pressure indication recording. 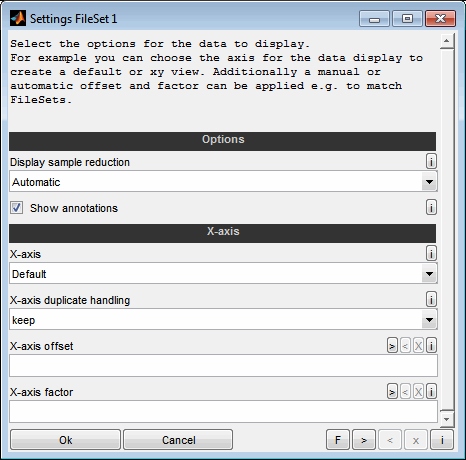 You can decide to split the selected channel, all channels of the selected FileSet or all channels of the common Y axis of the selected channel. Alternatively you can select the channels to apply to manually. Due to the very powerful possibilities for mark detection, the channel split can be carried out efficiently using very different possibilities, like logical marks or ramp detection. You can decide to split the data at the mark bounds, cursor positions or the actual x-axes borders. Enter a string to indicate the single split sections. The section number will be added automatically. E.g. "_sect" leads to "ChannelName_sect1/2/3"
One split can be selected whose channels are not renamed. This makes it possible to maintain e.g. 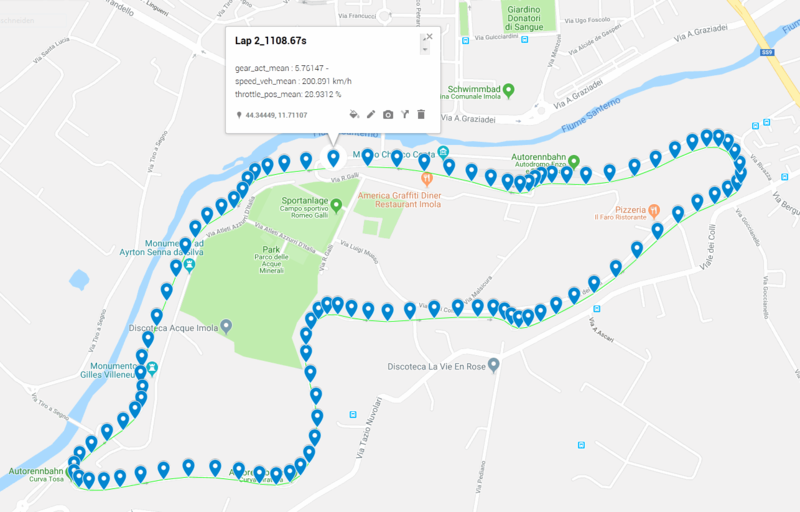 the overview and GPS view that are related to specific channel names. Enter a single number of the split to keep its channels names, e.g. 2 for the second split section. You can decide to shift the new channels to start at the minimum value of the x-axis data. In this way it is possible to create a superposition of the channels. You can decide to automatically color the split channels accordingly to the color of the corresponding first channel. The colors will get lighter with higher split numbers. This way you can easily come to a clearly visible comparison of the single split sections. You can decide to automatically create separate FileSets for all split channels of one section. This makes it easy to handle the channels of a split, for example, when switching visibility or deleting a split. You can decide to automatically create common Y axes for all split channels of one source channel. You can decide to delete or hide the source channels after splitting. This can affect only the channels that serve for the split or all channels existing before the split. The following example figures show the superposition of the single combustion cycles of a pressure indication recording. 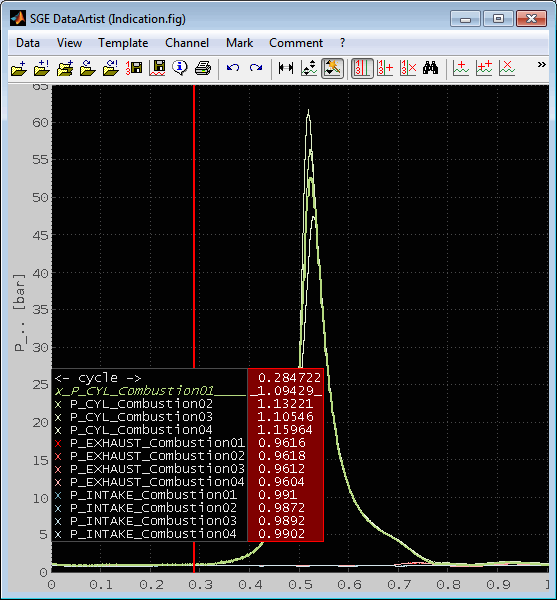 The split was done based on the marks set to cover the single combustions. If marks are existing you have the option to create a channel that will have a value of one inside the marks and zero outside. This channel can be used e.g. as a logical load condition according to the marks or to recreate the marks easily in a loaded template. 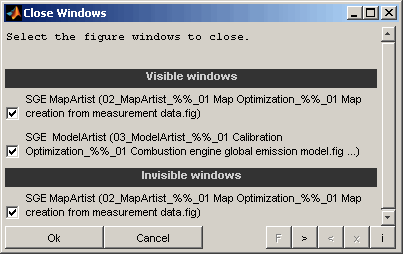 The DataArtist window has three main sections. The main view, the overview at the bottom and the GPS view at the right bottom. Overview and GPS view must be activated to be visible (F6). Using tabs enables to create multiple views in parallel. See section “Tabs”for details. The main view in the top section can be adjusted quickly by using mouse and keyboard shortcuts – e.g. zoom, unzoom (Mouse left button drag, +/-, Ctrl + Mouse Wheel) and panning (Mouse right button drag, (Ctrl + ) ← →, (Ctrl + ) Pageup/down). The view can also be reset to cover the whole axis range using shortcuts (Ctrl + F12, Ctrl + r). It is also possible to adjust the view to the cursor positions (Shift+space) if exactly two cursors are present and to resize the main view on the left and right end using the mouse to create space for the cursor if these should not overlay the main view. 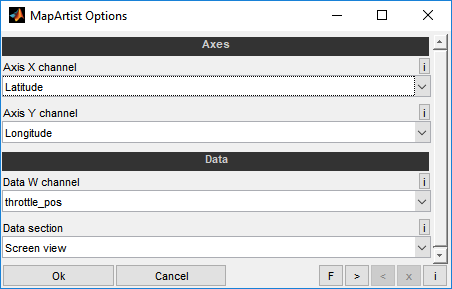 The window title and axes labels can be modified using the following dialog. Different strings can be written to the window top border above the menu and between the menu and the diagram. The labeling of the x- and y-axis can be modified. However when you select a channel the x- and y-axis will be relabeled and the modified labeling will get discarded. So this input is only useful to create a temporary view. By default the y-axis will be automatically labeled with the names and units of all channels assigned to the common Y axis of the selected channel. Therefore the label may consist of multiple lines. This may lead to a "jumping" behavior when switching between different channels. To avoid this you may check this option. Then only the selected channel itself will be used for labeling and therefore the label will consist of exactly one line. You can decide to display the channels by default as stairs, lines or stems. 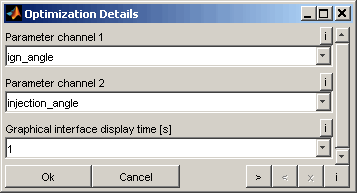 Anyway each channel can be configured individually using the Channel Configuration dialog (F4). Use this menu item to quickly turn on or off markers for the selected channel. If no channel is selected the markers for all channels are toggled. Use this menu item to quickly turn on or off markers+lines for the selected channel. If no channel is selected the markers for all channels are toggled. The overview (F6) always covers the whole horizontal axis range. If the main view shows only a section of it this is displayed in the overview by a white rectangle. The main view and this rectangle are linked. So you can zoom or pan in the main view and the overview rectangle will adjust or you can drag or extend the rectangle using the mouse and the main view will adjust. Additional rectangles can be created and activated by dragging with the mouse inside the overview. This allows quick switching between main views. Deletion is done by double clicking them. You can add any number of channels to the overview. By default each channel is scaled to fill the overview. In this case the overview does not allow any data value interpretation or comparison. Using the “Overview / GPS options“ enables you to apply a user defined range also for the overview. It is remembered as a preference and when the channel is used next time in the overview the user defined scale is applied. If you like to re enable the automatic scaling you could enter “auto” or just “a”. To quickly create a big number or exactly defined overview sections you must first create marks and can then create overview sections from it. The GPS view is shown when the channels for Latitude and Longitude are set and the overview is enabled. These channels must already be loaded. Even if its called a GPS view it can be used as an all-purpose xy view to display the operating point. If cursors are activated the positions are marked in the GPS view. The actual main view range is indicated by a continuous line. By clicking onto the GPS view the main view is centered to the GPS point clicked. 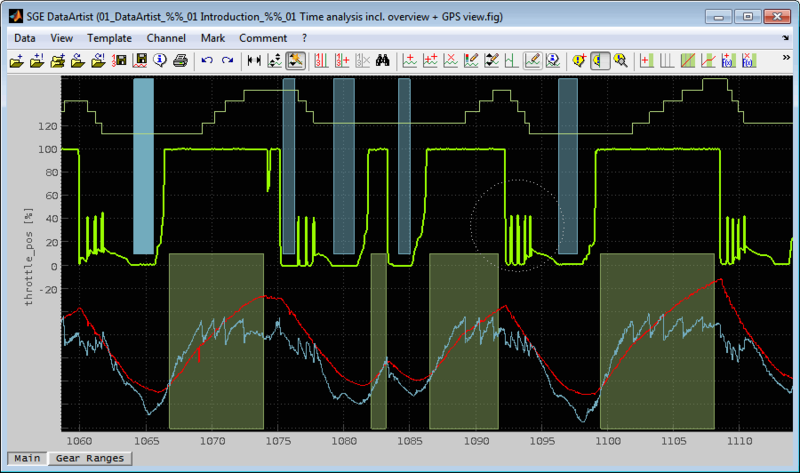 In case the data consists of multiple sections with similar GPS data (e.g. laps on a race track) you can click several times to the same GPS position to jump between the sections (=laps). Overview and GPS view are configured using the following dialog. Select the vertical part of the window height to cover by the overview-chart. Select the horizontal part of the window width to cover by the GPS view. Choose the channel to use as horizontal and vertical values for the GPS view. These channels must be already loaded. Enter range: Use format "Min : Max". E.g. "35 : 40". Leave empty: The range for the channel name will be filled from history if any. If no history entry is found the range will be chosen to match the data range. "auto": If you enter the string "auto" the range will be chosen to match the data range. If the data is messed up by outliers try to use the "Remove GPS data outliers" and "GPS horz. plausible limit" options. Use the same scaling for both axes for geological representation. If this option is activated, the scaling of both axes is automatically adjusted to each other in such a way that an undistorted geological representation is achieved. The scaling of the x and y axes are then coupled. To freely select the axis limits, this option must be deactivated. Enter a range to detect implausible horizontal GPS data values. Horizontal GPS values outside this range will be discarded. Use format "Min : Max". E.g. "35 : 40". Use this option if the data is messed up by outliers and the "Remove GPS data outliers" option does not lead to satisfying results. Remember that this option is used to remove implausible values. Use the "GPS horz. view range" option if you just want the modify the GPS view ranges. If enabled outliers will be removed automatically from the GPS data without the need to fill the “GPS horz./vert plausible limit” fields. Using tabs enables to create multiple views in parallel. Tabs can be added, copied, deleted, renamed and reordered using the corresponding menu item or the context menu. Use keyboard shortcuts to add (Ctrl + t) and activate tabs (Ctrl/Shift + tab) quickly. The single tabs are fairly independent. The loaded data, axes ranges, marks, cursors, overview/GPS view configuration does not interfere. Central settings like e.g. font size, background color and cursor settings are shared by all tabs. By activating the corresponding option the x-axis ranges will be synchronized. This means that the x-axis range is kept when activating another tab. Otherwise each tab maintains its own x-axis range. The option “Sync tab cursors” enables to synchronize the cursor positions of all tabs. If the corresponding option is activated the tab buttons will provide mouseover tooltips containing useful information like the files loaded. When replacing a FileSet while multiple Tabs exist sharing the same files you will be asked whether to replace the files for all Tabs. Tabs are also handled by sessions and templates. If you work with multiple DataArtist instances in parallel you can quickly import the channels displayed from the other instances using snapshot functionality (F5). These snapshots are static. They cannot be modified and are printed with display resolution. Therefore you will not see all data point when zooming. All instances of the DataArtist to use for snapshots must be started from the same SGE_Circus. Data cursors allow to analyze data quickly. Just click with the mouse into the axis area besides a channel and the first cursor will appear (Space). You can add any number of cursors (Ctrl + space). The selected cursor is the master. All other cursors display the differences from the master cursor besides their own values. In case of multiple cursors the master can be set by clicking the cursor line, double clicking the numeric window or by using keyboard shortcuts (Shift + 1..9). To remove the selected cursor press Esc. When moving a cursor with the mouse or the arrow keys you will get a cross cursor. If a channel is selected it is also possible to move the cursor with a keyboard shortcut to the next position where the value of the selected channel is changing (Ctrl + Shift + ← →). It is possible to adjust the view to the cursor positions (Shift+space) if exactly two cursors are present. The differences to the master cursor can be shown as absolute and / or relative values. If deactivated hidden channels are not shown in the cursor. If activated hidden channels are shown in the cursor. This way their data values can be visualized while their data curves remain hidden. If activated only the selected channel is shown in the cursor. If no channel is selected only the axis information will be displayed. The order of the channels inside the cursor table in kept sorted when adding or removing channels. Specify one or more sort criteria (like name, Y-axis position, FileSet, common Y axis) to sequentially order the cursor channels. This is useful when only one sort criterion does not result in a unique sequence. These action changes the cursor order once. Unlike the “Sorted order” option the order is not updated when channels are added. If activated all channels sharing a common Y axis with the selected channel are displayed with a common sign in front. If the measurement data contains information to translate numerical data to text and this option is activated the cursor will display the text instead of the values. E.g. the display may be “Gear5” instead of 5. This option is also useful in case of a FileSet consisting of multiple files is loaded and the single files should be identified using the channel “FileCnt” (Open / Add / Replace FileSet). Choose to display a data tip near the cursor position while moving the cursor using the mouse or keyboard. The data tip will show axis value of the cursor and the value of the selected channel at the cursor position. When this option is activated the numerical values inside the cursor window(s) are only updated when the movement of the cursor line via mouse or keyboard is stopped. Therefore the movement of the cursor line is very smooth even when big data amounts are displayed. On the other hand the values cannot be judged while moving the cursor lines. If activated all channels names in the cursor table will be colored accordingly to the channels. If deactivated only the selected channel will be colored. Enable to use a bold cursor font. Different color schemes are available to improve the readability especially under dark and bright ambient conditions. The selected channel will be indicated by filling the spaces in the corresponding line with an indication character which is user selectable. The channel order inside the cursor table can be modified by menu item or keyboard shortcut (Ctrl + Shift + Up / Down). The “Sorted” attribute will be automatically turned off in this case. If the GPS view is activated all cursor positions are marked there. The cursor table containing the channel names can be moved vertically using the mouse and between the left and right side by dragging it with the mouse to the other side. You will not see the horizontal movement until you moved the mouse completely to the other side. Additionally the main view can be resized on the left and right end using the mouse to create space for the cursor if these should not overlay the main view. Marks define parts of the axis range. They are displayed as green rectangles covering the corresponding axis range in the main view. They are used to define sections for data analysis, saving and optimization. Marks can not overlay. Marks can be created manually or automatically in several ways and using the mouse while Shift-key is pressed. A mark can be created by entering the x-axis start and end value of the mark (Shift + Ins). Alternatively draw a new mark with the mouse with Shift-key pressed in the main view. Marks can be deleted by using the menu item, a keyboard shortcut (Shift + Del) or dragging them outside the main view with the mouse while Shift-key is pressed or by definition of criteria depending on their length and axis positioning (Ctrl + Shift + Del). Check to delete all existing marks ignoring the other criteria below. Marks are deleted if they are shorter than this length. Leave empty if criterion does not apply. The range and max. length criterion must also match or be empty. Marks are deleted if they are completely located between the "starting" and "ending" x-axis value. Leave empty if criterion does not apply. The length criteria must also match or be empty. Choose the sections to delete marks from. The mark must be completely within the section for the condition to apply. You can configure the marks color and transparency for all or the selected marks (Ctrl + Shift + F4). You can decide whether so save the settings as a global preference. Select the mark color by pressing the button. Select the mark transparency level. Select the lower end of the y-axis section to cover by the marks. Select the upper end of the y-axis section to cover by the marks. Select whether to apply the settings to all or the selected marks. Select whether to save the settings as a global preference. 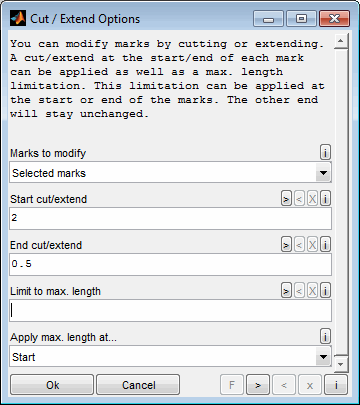 You can modify marks by cutting or extending them (Shift + x). This option defines the marks to apply the modifications to. This can be all marks, only the selected marks or only the marks at least partly inside the current screen view. This is cut off from every marked section at the beginning. It can be used to remove transient areas at the beginning. If it is negative the mark is extended by this length. This is cut off from every marked section at the end. It can be used to remove transient areas at the end. If it is negative the mark is extended by this length but limited to avoid overlap with the next mark. Marks can be limited to a total maximum length. You can choose whether to apply this change at the beginning or end of the mark with the following option. The other end of the mark will stay unchanged. This can be used e.g. to cut transient sections at the start of the marks. As is is possible to move the mark borders in both directions it is also possible to completely move a mark by e.g. extending its start and cutting its end by the same value. Using this option unmarked sections are marked and the existing marks are deleted. Marks can be imported from a data file. So if you have the mark start and end axis values in a file you can use this to quickly create marks. This is especially useful to recreate marks that were saved together with data to a file before. For all automatic mark creation procedures you can choose in which section you want to work. New marks will only be created inside the already existing marks which will therefore be deleted. This way you can do a step wise mark detection. E.g. you can first set marks to find traction control activation inside a measurement. Then you detect sections inside these marks with specified torque range. You can also activate a section optimization. See below for details. Each section to work on will be split equally into a number of new marks (Shift + i). Zero has a special meaning: The sections are split into the single data points. This is e.g. useful if you want every single data point to be used in a optimization separately. If you have a big number of data points you should turn off drawing marks in this case because it slows down the graphics. 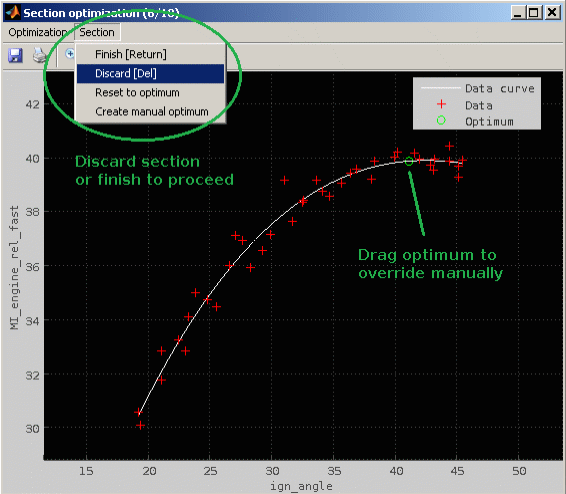 See “Section optimization“ for details regarding this option. This method creates marks using a channel and a classes vector (Shift + c). The channel will be used to determine splits when the value of the channel crosses of the classes vector values. So for example you can automatically set marks that classify the measurement into sections of 1000 1/min during an engine speed ramp. Additionally you can use the axis to create classified marks of a specified length. Choose the sections to search for ramps or steps. It can be the whole file. Existing marks will be deleted in this case. It can also be all existing marks or only the selected marks. Choose the classification channel. 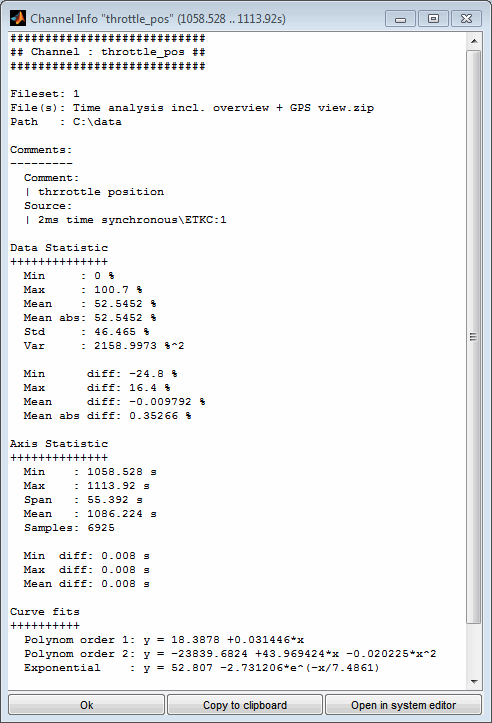 This channel will be used to determine split times when the value of the channel crosses of the classes vector values. So for example you can automatically set marks that classify the measurement into sections of 1000 1/min during an engine speed ramp. Additionally you can use the axis to create classified marks of a specified length. This vector contains the borders of the classes. The vector must be written in valid syntax. "3000 : 1000 : 10000" means from 3000 to 10000 in steps of 1000. "1000 3000 6000 1000" defines the borders directly. To avoid creation of multiple marks at the classes borders due to a toggling signal a minimum demanded mark length can be defined. Marks shorter than this axis length will be skipped. You can search areas in the measurement, where a channel has ramp or step characteristic (Shift + r). 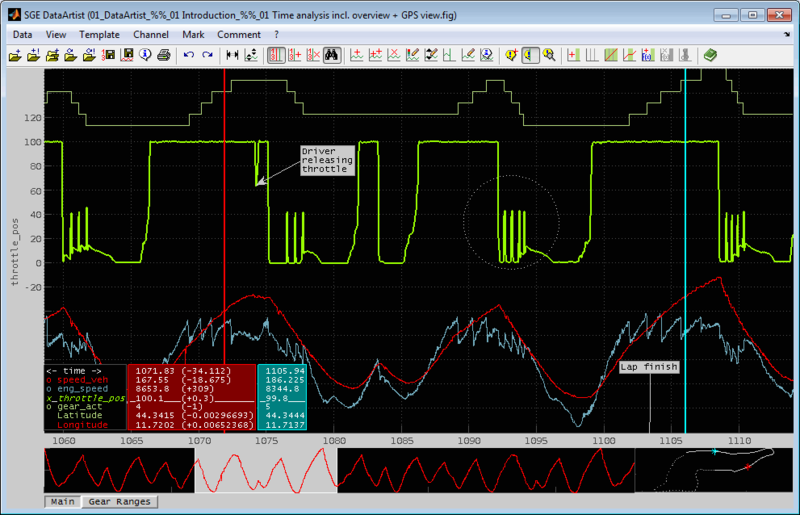 So for example you can extract the measured ramps in engine bench measurements omitting the warm up and stop engine areas. Or you can analyze ignition sweeps. If you need more than one channel to identify steps insert a calculated channel that is the sum or product of all needed channels. Factors can help to adjust big differences in signal ranges. A helper function for this case is "multichannel_normalize". It can be passed any number of channels that will get scaled and multiplied. See the SGE_Circus calculated channel documentation for further information. 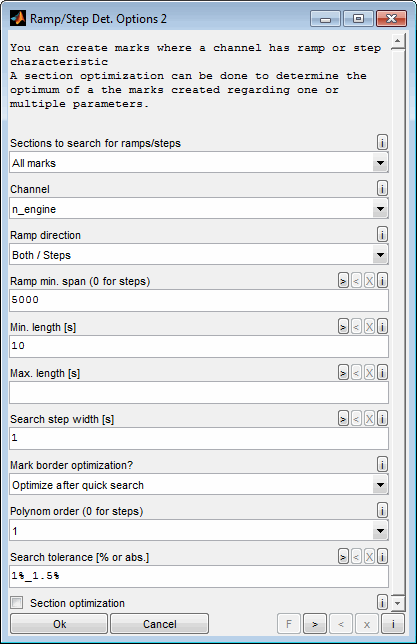 Choose the channel to search for ramps or steps. Choose the ramp directions that should be searched. In case of step search choose "both". This span between minimum and maximum value a ramp must cross. Leave empty or use zero in case of step search. Value must be positive or zero. Minimum length a ramp/step must last. Value must be positive or zero or empty. Normally the value should be greater than zero to avoid the detection of a big number of zero length marks. Choose the value a little bit smaller than the shortest expected mark. Maximum length a ramp/step may last. Ramps are not cut to this length but discarded if they are longer. Normally this field will stay empty or filled with a value bigger than the longest expected mark. Value must be positive or zero or empty. To speed up detection a quick search is done first. Afterwards the found ramps/steps are corrected with full precision. For the quick search the x-axis step width can be chosen here. It should be at least 5 times smaller than the shortest expected ramp/step. The quick search does not reduce the precision of the data during the ramps/steps. 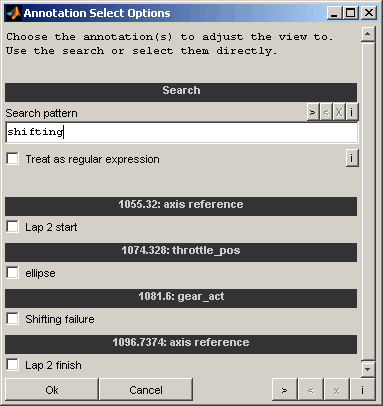 If no step width is used, it is set to zero and the search may be very slow. If you choose no optimization here to save time only the quick search is done. So the marks will only be as exact as the quick search step width. The order of the polynomial influences the possibility to fit linear or more complex data trends during the ramp. Use 1 for linear ramps and increase if necessary. For step search choose 0. The fitted polynomial for each ramp/step is displayed in the diagram (until the finish message is closed) and helps to adjust the polynomial order. It can be relative or absolute. If the value ends with % it is regarded as relative. It is then measured in percent of the mean channel value in the section. This is not suitable for data around zero. If it is a number without % at the end it is interpreted as absolute value measured in the units of the chosen channel. Higher values allow more deviation of the data from the polynomial. Must be >= 0. Start with small values and increase until all ramps/steps are detected. For step measurement the tolerance must be smaller than half of the step size. Otherwise neighbor steps will not be separated correctly. The tolerance for each ramp/step is displayed in the diagram (until the finish message is closed) and helps to adjust the tolerance parameter and polynomial order. 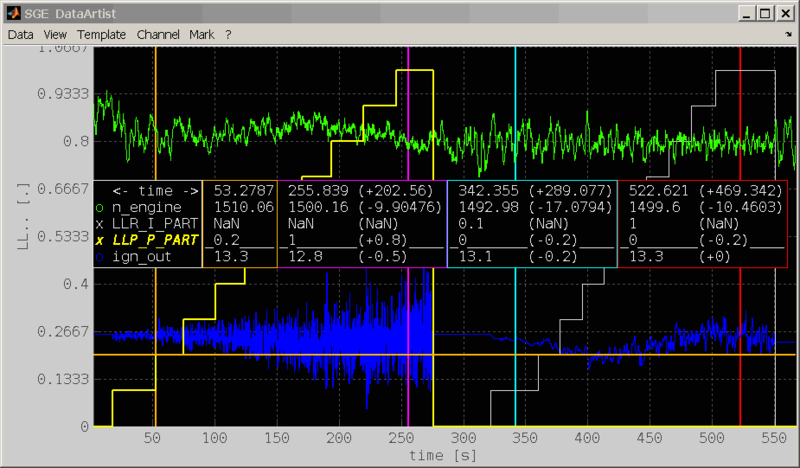 If you encounter problems with separating ramps or steps from the signal jitteringy using a filtered channel. You can search in the data for sections where a logical condition is true (Shift + l). Logical mark detection is very fast compared to other methods. Using calculated channels to define the condition enables to perform complex mark detection. You can modify the logical condition in a graphical manner using the push button. It must only consist of 0 and 1 and must have the dimension of one of the axis vectors. Marks will be created where the condition is true. Using the channel object you can access the loaded channel data. 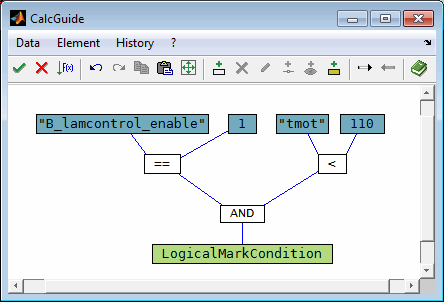 The following picture gives an example for “Create marks where "B_lamcontrol_enable" is true and "tmot" is below 110”. To avoid creation of too short marks a minimum demanded mark length can be defined. Marks shorter than this axis length will be skipped. Must be shorter or equal to max. length or empty. Section optimization can be activated for every automatic mark detection method. This allows to determine the optimum of a section regarding one or multiple parameter channels. In this case the produced marks of a section are regarded as single points and an optimum point is estimated. With this function you can e.g. evaluate ignition sweeps or find the minimum fuel consumption for a operating point depending on injection and cam timing. The result of a section optimization are then additional channels that contain for every section optimum values (*_opt) for parameter and optimization channel and the fitted values (*_fit) for the optimization channel for every mark. To save the result you can easily mark all optima with a logical condition. First you do a mark creation (without section optimization) with one mark containing one operating point. So e.g. one mark covers the section of the measurement where engine speed and load are constant. During this section the ignition angle is varied. Then you start a mark creation in the already existing operating point marks with criteria to mark the single ignition angles. During this mark creation activate the section optimization. Then you are asked to choose the settings for the optimization. Choose the channel to optimize. E.g. torque, fuel consumption or cylinder mean pressure. 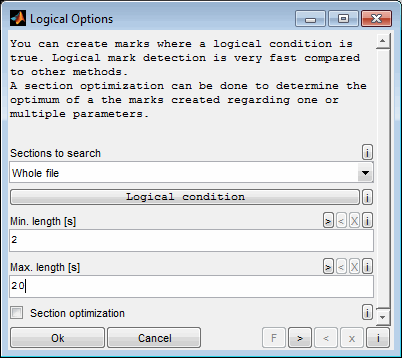 Choose the statistic calculation for the optimization criterion for each mark. This can be e.g. the mean value if you want to optimize torque or the standard deviation if you want to optimize combustion. Be aware that this is not the optimization direction. Which direction is optimum? Do you search the highest or lowest value? See below for the different method to find the optimum. 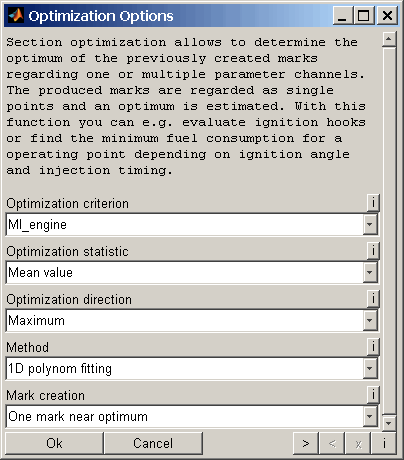 You can decide how the marks that are created and used for optimization are kept and displayed. You can keep all marks, no marks or only the nearest mark to optimum. Additionally you can decide to draw one big mark that covers the whole section. The mark creation can be used to influence the data saving behavior. If you choose e.g. statistical calculation you perhaps want the mean value of the channels only near optimum so you decide to keep only the nearest mark. Or you want a stable mean value for the whole section so you decide to draw a big mark for the whole section. 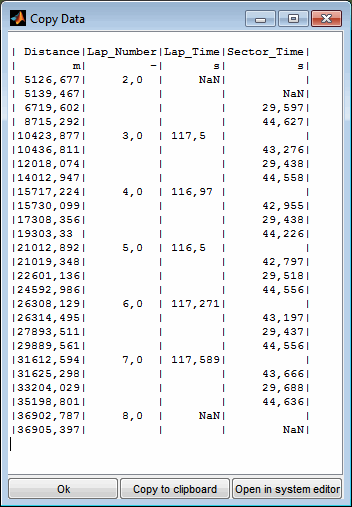 If you are doing an optimization of a big measurement and creating lots of marks during optimization it is useful for runtime and memory usage not to keep all marks but only one per section. Different methods to find the optimum are available. These differ in the number of dimensions (= number of parameter channels) and the method used to fit the data and determine the optimum. 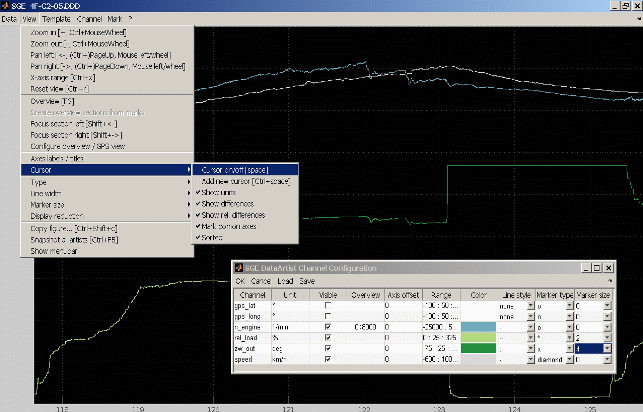 You can choose one parameter channel (e.g. ignition angle). A polynomial curve (order can be chosen) is fitted to describe the relation between the parameter and the optimization channel to find the optimum value for the parameter. A polynomial curve generally does some kind of measure error compensation. This method is only useful if the data shape can be described by a polynomial. Choose the channel that is influencing the optimum. This channel will be modified to find the maximum/minimum of the channel to optimize. E.g. the ignition angle in case of ignition sweeps. Choose the polynomial order used to fit the data. If the number of points (=marks) in the section is not sufficient to calculate a polynomial of the demanded order, the order could automatically be reduced. Otherwise the section will be skipped. Choose if the fitted polynomial and therefor the optimum can be outside of the measured range (extrapolation). A graphical interface is available during optimization. Choose the time to display the GUI. 0 means no GUI and "inf" shows the GUI until user input. All other values are times in seconds. 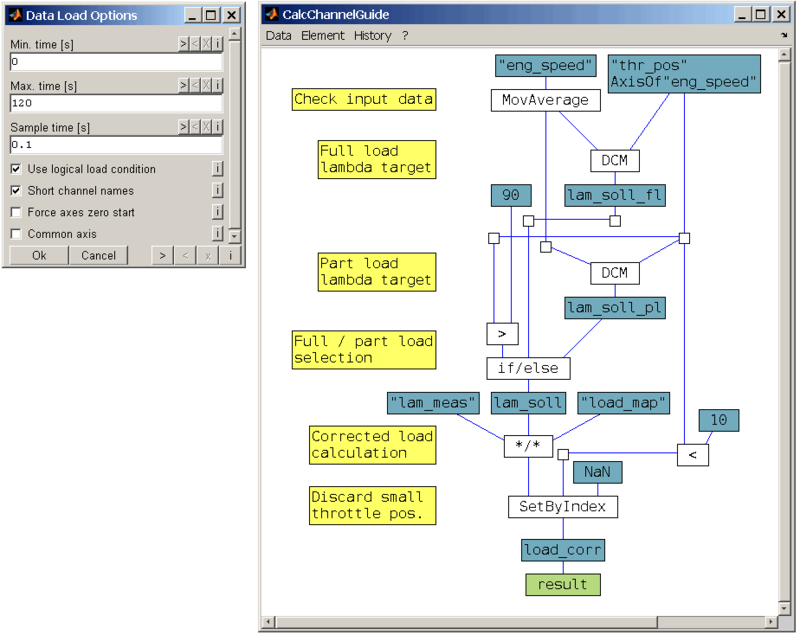 Choose "torque" as optimization channel and "ign_angle" as parameter channel. Then "torque_opt" and "ign_angle_opt" will be created as new channels containing the optimum torque and corresponding ignition angle during the sweeps and NaN otherwise while "torque_fit" contains the fitted polynomial values for each mark. With the logical condition ~isnan("torque_opt") you can easily mark all optima to save them as statistical values. This method works very similar to "1D polynomial fitting" but instead of the polynomial a cubic curve is used. This is useful if the data behavior cannot be described by a polynomial and has little measurement errors, because the fitted curve will always contain the measured points. From the marks of the section the best one is simply selected. No interpolation or fitting is done. Therefore the optimum will always be a member of the created marks and no optimum in between can be found. This method works similar to "1D cubic interpolation" but for two parameters. 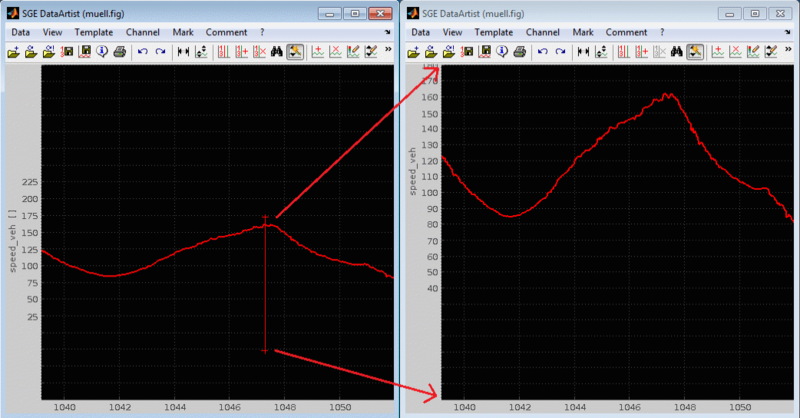 So two parameter channels are asked and a map is fitted to the data. From this map the optimum is chosen by cubic interpolation. Map creation can be influenced in various ways. Choose the first channel that is influencing the optimum. This channel will be modified to find the maximum/minimum of the channel to optimize. E.g. the injection timing. Choose the second channel that is influencing the optimum. E.g. the cam timing. Choose the method to fit the map. Different methods like quick or optimized maps and planes are available. Choose if the fitted map should be smoothed by buckle removal method. Choose if the fitted map should be smoothed by corridor method. 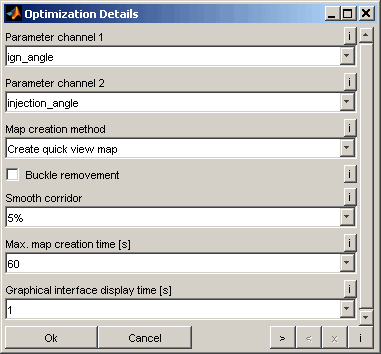 Choose the maximum time for map optimization and smoothing (each). This method works similar to "1D simple selection" but for two parameters. From the marks of the section the best one is simply selected. No interpolation or fitting is done. Therefore the optimum will always be a member of the created marks and no optimum in between can be found. A map fitted to the data points is displayed but only for visualization. 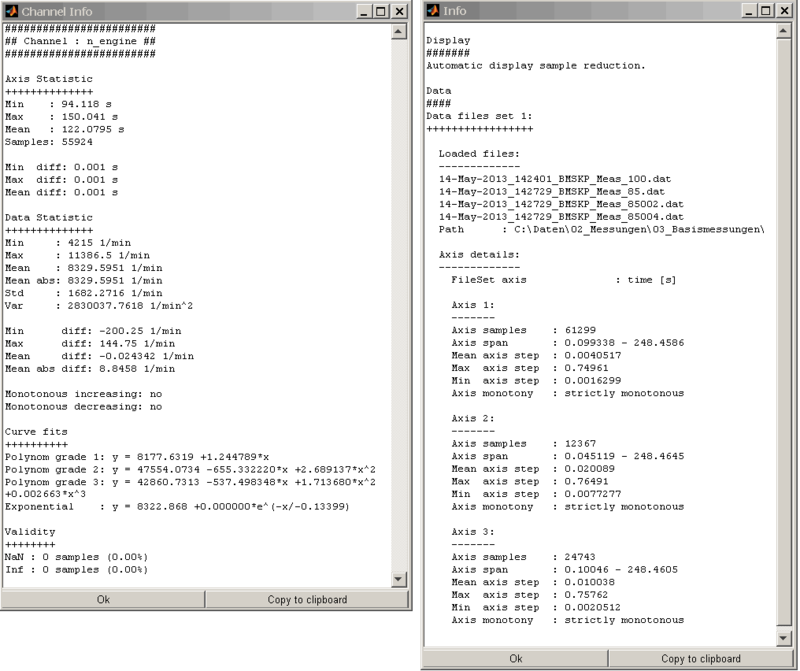 The optimization is done separately for each section the mark creation is done in. Each optimization can be influenced by the user. 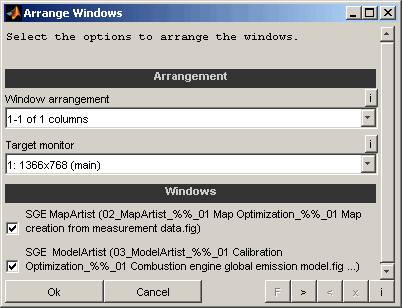 Depending on the “Graphical interface display time” setting a window will be shown temporarily for each optimization showing the data, fit and optimum. After the chosen time the window will disappear automatically without interaction. By pressing a key or clicking to the window the automatic proceeding will be disabled. To override the optimum evaluated by the method chosen just drag the optimum circle using the mouse and proceed choosing by “Section → Finish”. Confirm the optimum of the current section shown in the window and proceed to the next section. Discard the optimum of the current section shown in the window and proceed to the next section. Reset a manually modified optimum to the one evaluated by the method chosen. Sometimes the automatic optimization may not determine a optimum. In this case the green optimum circle in the window is missing. Using this option a manual optimum will be created and may be modified using the mouse afterwards. Stop the entire section optimization. A partial result will be preserved. During optimization the user will be asked whether to automatically save the windows to individual files. Annotations enable to highlight and notice events in the data loaded. The visibility of the annotations can be enabled or disabled for all annotations in common (Ctrl+a). A textual listing of all annotation can be retrieved using the (Data) Info (Ctrl + i). Different types of annotations are available as well as different reference types of the annotations (Ctrl + Shift + a). The following figure shows examples of annotations. A text arrow contains of a text box and an arrow connected by a line. 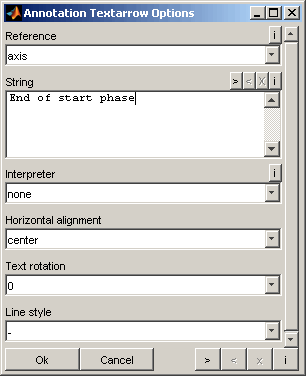 The position of text box and line can be adjusted using the mouse. The text an some additional properties can be modified to change the appearance. A text arrow can be linked to a channel or the axis. A text box carries some text and has no relation to the channels or axis. The text an some additional properties can be modified to change the appearance. A text box can only be linked to the window. A ellipse or rectangle may be used to encircle a section or data event. The background is transparent. A ellipse/rectangle cannot contain any text. The position can be adjusted using the mouse. Some additional properties can be modified to change the appearance. A text arrow can be linked to a channel, the axis or the window. Reference means that each annotation is linked to either a channel at a specific axis value, or to an axis value independently from a channel or to the window. The reference type essentially influences the behavior of the annotation when e.g. the view is modified (e.g. zoom, axes ranges). The annotation is linked to the window. Its position will remain unchanged even in case of changing the view by e.g. zooming. The position can be adjusted using the mouse. Window linking is improper to highlight data events or axis points. Window linking in available for ellipse, rectangle and text box annotations. The annotation is linked to the axis. Axis linking is available for text arrows. The arrow is fixed to an axis position and will be automatically kept on that position in case of e.g. zooming. The text position can be adjusted using the mouse. Axis linking is a proper way to highlight axis points. When a annotation is added using axis linking the initial position will be retrieved from the cursor if any. Otherwise the mouse position will be used or the middle of the axis if the mouse is outside the window. The annotation is linked to a channel at a specific axis position. The annotation is fixed to the channel data value at the axis position and will be automatically kept on that position in case of e.g. zooming or channel range modification. The text position can be adjusted using the mouse. Channel linking is a proper way to highlight data events. Channel linking in available for ellipse and rectangle annotations. When a annotation is added using channel linking the initial position will be retrieved from that selected channel at the cursor if any. Otherwise the mouse position will be used or the middle of the axis if the mouse is outside the window. Annotations can also be created automatically from file events/comments (Alt + Shift + a). Some file formats (e.g. *.mf4) support to store event data. This can be for example trigger events or user pause comments. Depending on the type of event annotations of different types are generated. In case identical annotations are already exist the annotations to load will be skipped. The filter criteria determine which annotations / events are taken from the files. For each available criterion select the value that must apply for the annotations to load from file. The menus contain all available entries of all loaded files and an entry that includes all options. Remember that all filter criteria must apply for the annotations to create. The menu contains all available entries of all loaded files and an entry that includes all options. Enter a string that must be included in the comment of the annotations to create. Leave empty to not filter depending on the annotations comment. The wildcard * can be used to match any characters. If the string starts with a / the expression will be evaluated as a regular expression. Remember that all filter criteria must apply for the annotations to create. 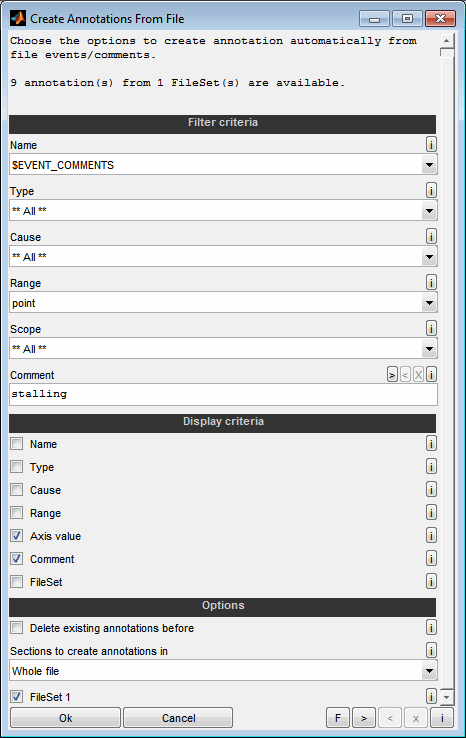 The display criteria determine which part of the available attributes is displayed for the annotations that will be loaded from file. Select which attributes to show in the annotations textbox. Additionally you can decide to delete all existing annotations before creating new ones from file. The axis range can be adjusted quickly to show one or more specific annotations (Shift + a). Using the corresponding menu item you will be asked to select the annotations to show or search for them. Annotations can be deleted using the corresponding menu items or the keyboard if a annotation is selected. In case of deleting channels the linked annotations will be deleted automatically. Some properties of the annotations can be modified. Using the corresponding menu item or double clicking the annotation leads to a dialog enabling to edit it. Template files are used to restore data and view configuration efficiently. It is also possible to import *.xda configuration files. Templates are data configuration and view configuration saved to a file. You can save a template from the DataArtist at any time (Shift + s). As this file only contains configuration information it will be much smaller than a session file. But this also means that you need the data files available to load a template. Template files are therefore not useful for data exchange or or long term storage as file path may change. In case multiple tabs already exist you will be asked whether to save all tabs or only the active one. You can load a template directly after you started the DataArtist or when you already loaded data (Shift + t). Depending on the number of existing tabs as well as the number of tabs inside the template you may be asked some options. Decide how to handle the existing tabs when adding new tabs from template. Replace all tabs: All existing tabs will be discarded before loading the new tabs from template. Replace active tab: The active tab will be replaced by one one more tabs loaded from template. All other tabs remain unchanged. In this mode exactly one tab must be selected in the bottom section. Add new tabs: All existing tabs remain unchanged. New tabs loaded from template will be added at the right end. Select the content to load from template. Files and Settings: All FileSets and tabs from the template will be loaded and the setting like axes ranges and colors will be applied. Only Settings: Only settings like channel, axes ranges and colors will be applied to the already loaded FileSets and tabs. If the template includes more FileSets or tabs that already loaded the missing items will be retrieved from template. Select which tab from the template to load. In mode “Replace active tab” exactly one tab must be selected. In case multiple tabs already exist you will be asked whether to load the entire template (and replace all existing tabs) or to load only the active tab. In this case all other tabs remain unchanged. To load a template you can choose the file or access recently used templates from the menu directly. When data should be loaded and the data files are not available you will be asked to choose the files manually. Additionally to the manually saved templates a template gets saved every time you exit the DataArtist. These templates are available as “LastTemplate” list. So you can quickly access the configuration used. The name of the template hints to the configuration as it includes the file and channel number and an abbreviated name of the first data file opened. The list of recently used templates is managed automatically. So entries are automatically removed when the underlying file was deleted. Additionally you can decide to remove entries you don't need any more. You will be asked if you only want to remove the entries or also want to delete the files. Some restriction apply when using templates. When creating channels using the wizard templates saved may not work correctly. When using xy-view combined with calculated channels templates saved may not work correctly. Generally it is recommended to test loading a saved template before the source window is closed if you use not standard configuration. In case of problems you can always save a session file. The whole session including data can be stored as file (Ctrl + Shift + s). After re-opening the whole functionality can be used again immediately. Sessions also work with xy-view, wizard channels and special channel configuration (e.g. marker). Session files can be opened the same way as data files or using the SGE Viewer. Session files may get very large as they contain the loaded data. Consider using templates if you want to make views and setting available. But remember that using templates brings some restrictions. See the template section for details. You can use the DataArtist not only to view data. You can also save data to one or multiple files (Ctrl + s). This may be the already loaded channels from the display. Or all channels that the loaded file(s) contain. This is a convenient method to quickly arrange the data section to save with only some channels loaded and then to save all channels from file without displaying them. It is also possible to do a manual selection of the channels to save. In case multiple FileSets are loaded the channels to save will be asked for each FileSet sequentially. The data can be saved in different formats. OpenOffice (*.ods), when Apache OpenOffice is installed. Excel (*.xls), when Microsoft Excel or Apache OpenOffice is installed. This format allows you to import the data into Google Maps/Earth. This allows you to display the data geographically. In addition, it is possible to visualize the loaded data. In this way any measurement data can be displayed geographically. Select which axes the stored data should have. You can either keep the axes unchanged or interpolate all data to a common X-axis. This new axis can be either that of a loaded channel or the total number of axes of all channels to be saved. Double points are removed to obtain a strictly monotonous axis. Therefore, the order of the axes in the stored data may differ from the displayed data. The calculation is performed only for the data to be stored. The loaded data will not be changed. Some data format (like spreadsheet and csv) require a common axis. For these formats this options will be activated automatically even if "keep" is selected. Select the interpolation mode to use when channels need to be interpolated to new axes. left : Look for the next value of the affected channels to the left axis side. In this way, only values that are actually contained in the data can be created. However, the data can be "old". linear: Perform an linear interpolation of the affected channels. This can result in intermediate values that are not contained in the loaded data. If this option is active, only the data points that change are stored for the channels to be saved. As long as a channel has a constant value, these points are removed. This reduces the file size, but changes the data. Decide whether they value file size or unchanged data. 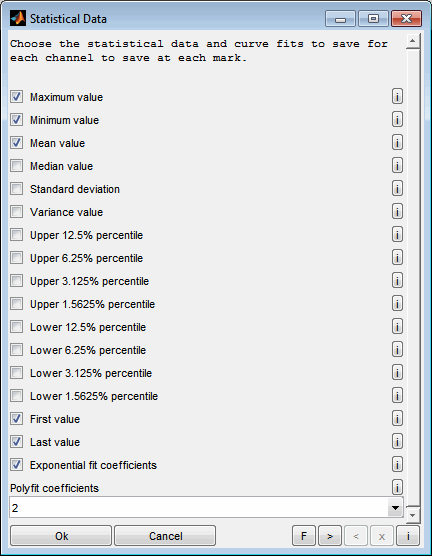 This option can only be used for MDF3/MDF4 target formats and not for statistical data. Several possibilities to define the axis range and mode of the data to save are available. The entire data loaded will be saved. The data section of the actual view will be saved. If the sections to save are based on existing marks you can save them to one or multiple files. In case of multiple files the first file name is asked and all other file names are based on the first one including a counter. When saving to one file the axis could be shrinked to have the data concatenated in the new file. 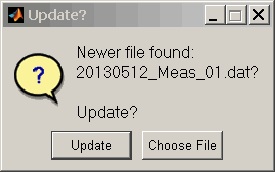 Otherwise the unmarked section will appear in the new file without values. This is a special mode that evaluates each mark separately calculating statistical results. So in the resulting file for each mark will appear one value. The channel name is appended with a string indication the statistical calculation like “_mean” or “_max”. Additionally to the standard statistical calculations curve fits (exponential, polynomial) are available. The variance is the square value of the standard deviation. The median of a collection of numeric values is the value that appears in the middle of the list when sorting the values by size. This means that half of the values are larger and the other half smaller. A percentile of a collection of numeric values is the value that divides the collection into x % higher and 100-x % lower values. You can calculate the first / last value inside the marked sections. 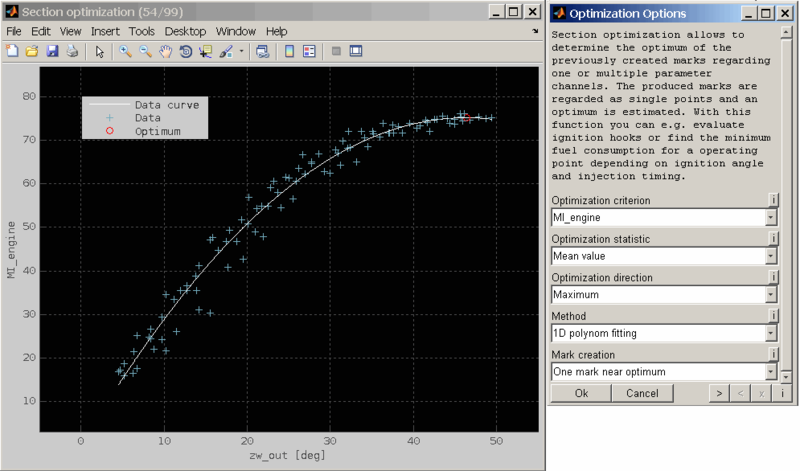 The resulting parameters from the curve fits and the determination criteria of the fitted curves are saved. This feature is useful for e.g. ignition sweep evaluation or exhaust gas temperature prognosis. Data can be transferred comfortably to the clipboard or an external text editor (Ctrl + c). In this way, parts of the data can be made visible very quickly or used outside the software. The format of the clipboard content is configurable will be suitable to paste into a spreadsheet software. Copying big amounts of data may last long and exceed the capabilities available. Choose the sections to copy the data to clipboard from. At the axis positions to copy some channels may not contain values. This might happen e.g. because of different data acquisition rates. You can decide how to proceed in this case. None: Do not fill missing values automatically. Affected channels or axis positions will be missing in the copied data. Left: Look for the next value of the affected channels to the left axis side. In this way, only values that are actually contained in the data can be created. However, the data can be "old". 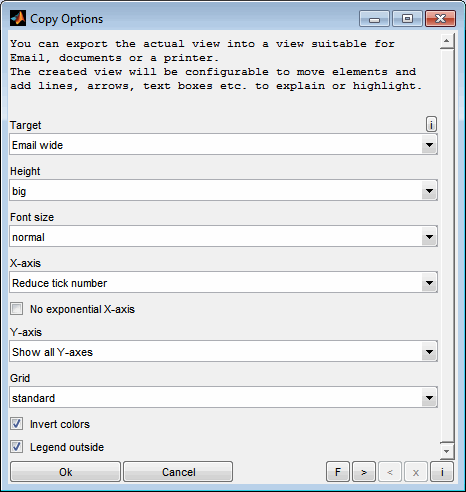 Select the target for the copied data. It can be the system clipboard or a visualization that enables to view the data and to open it in an external editor. Choose the decimal separator for numbers to use when copying. Choose the field separator to use when copying. Use "Auto" for automatic detection depending on "Target". Enter the maximum number of decimal places to use. Leave empty to detect automatically. Analyzing data often includes the need to present the results. Therefore the DataArtist makes it available to export the actual view into the clipboard or file formatted in a way that is suitable to be useful for different targets (Ctrl + shift + c). ©2019 Google LLC All rights reserved. Google is a trademark of Google LLC.